Depth contours are plotted at the following bathymetric levels: 3000 m, 2000 m, 1000 m, 500 m, 200 m, 150 m, 100 m, 80 m, 60 m, 40 m, 20 m.
The data displayed on this page are collected as part of a satellite-tracked drifter study in the Northeast Chukchi Sea in the summer of 2011. 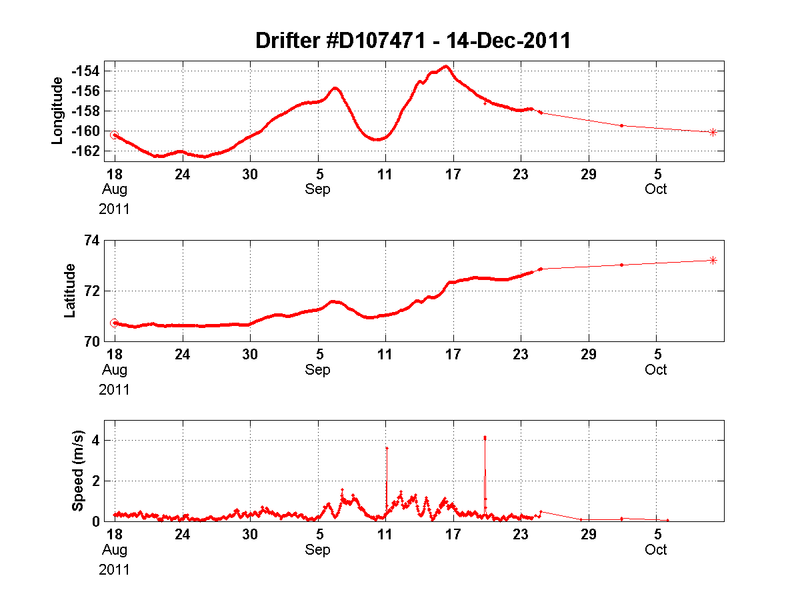 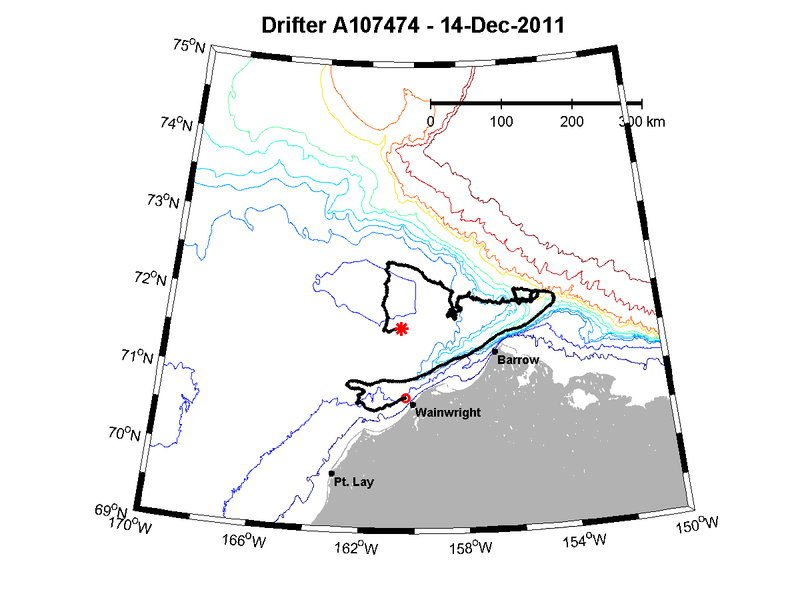 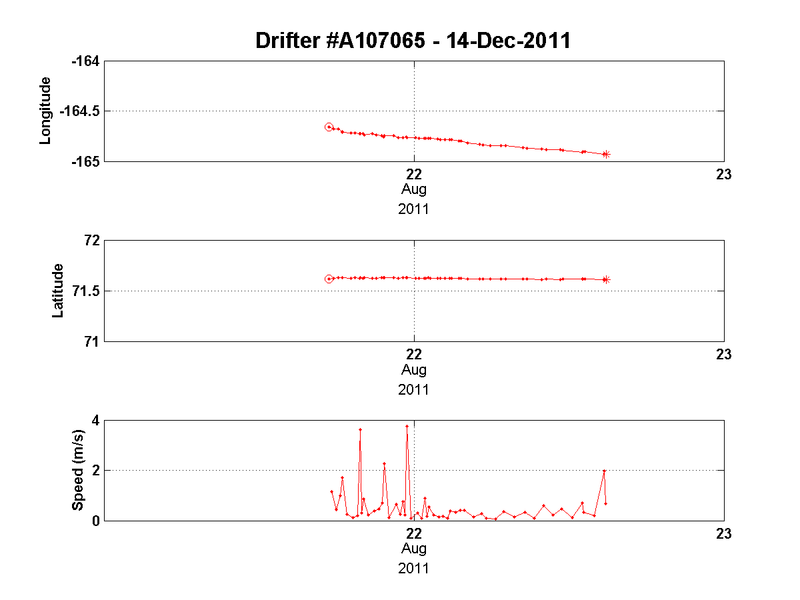 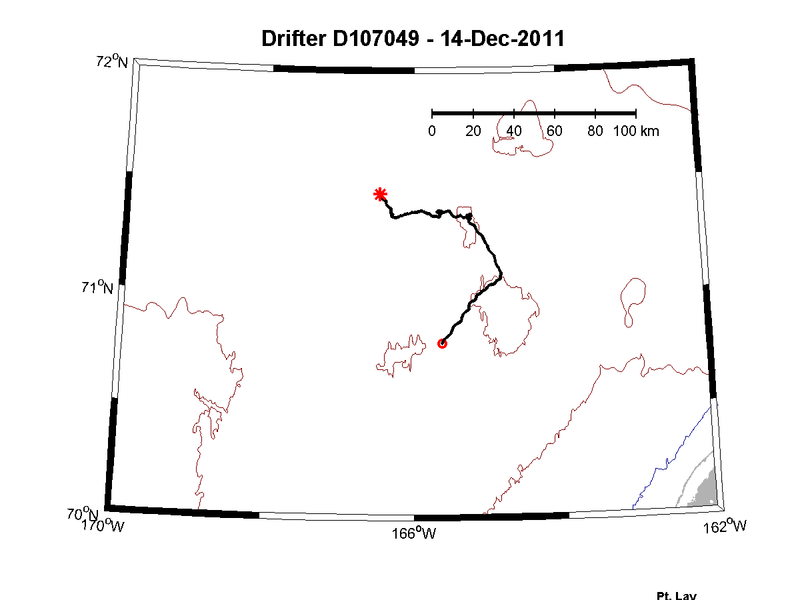 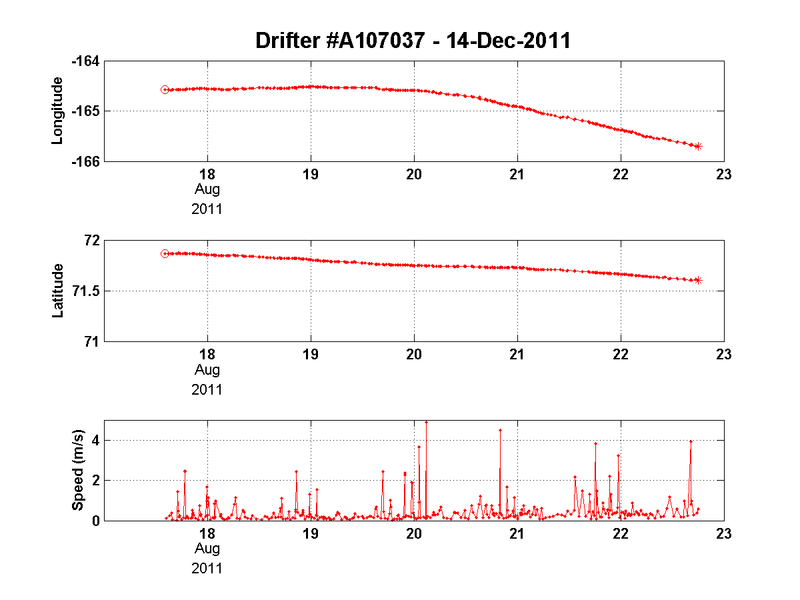 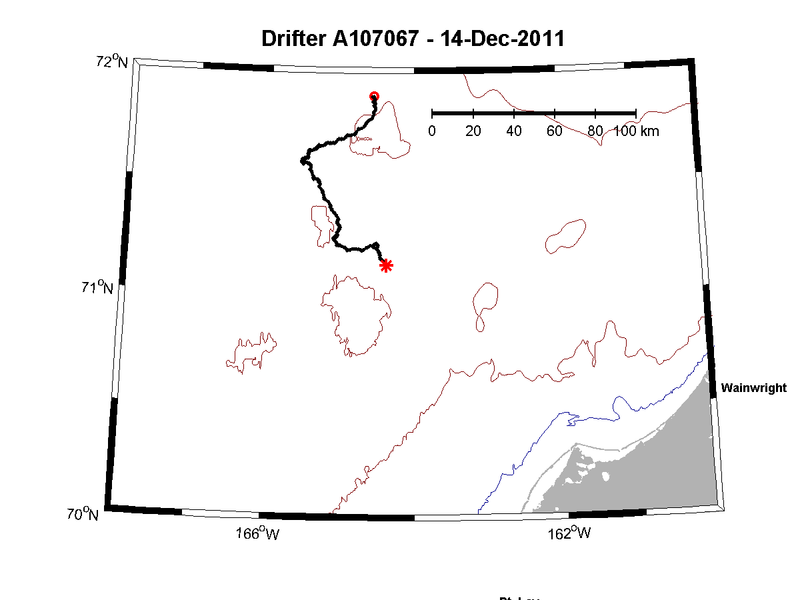 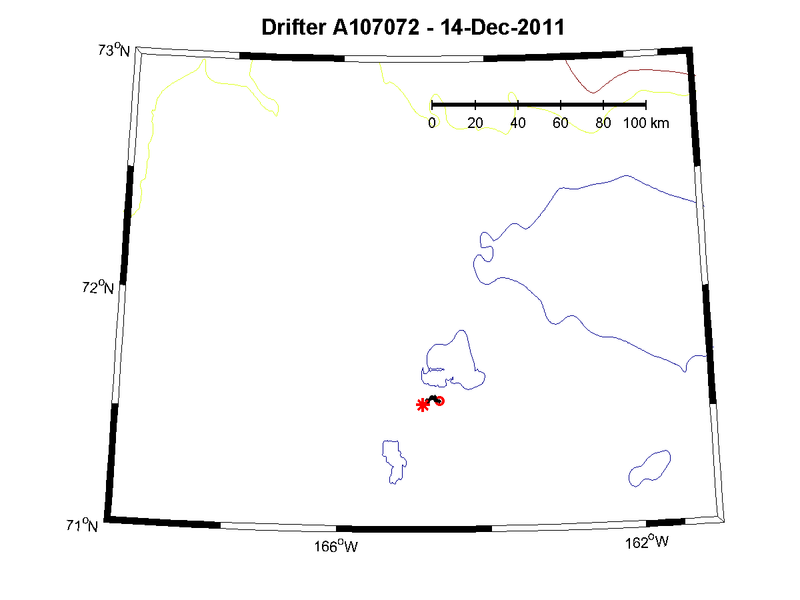 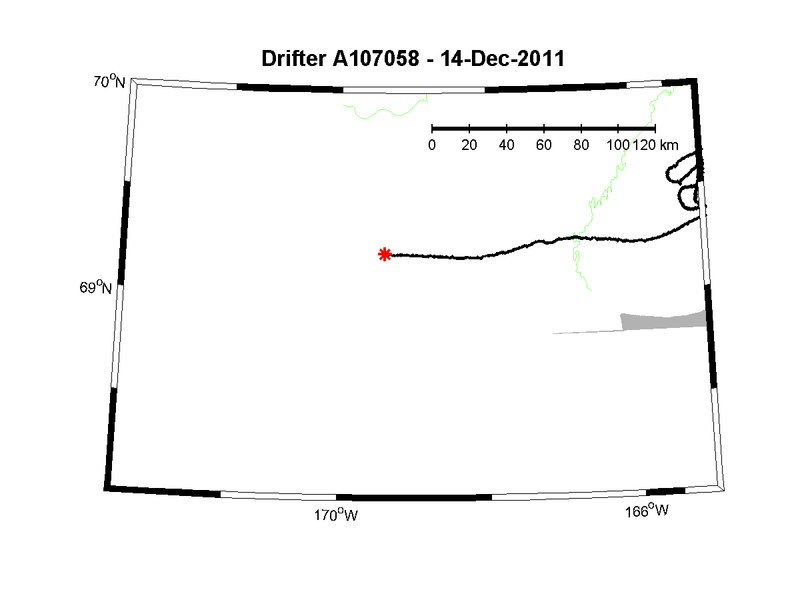 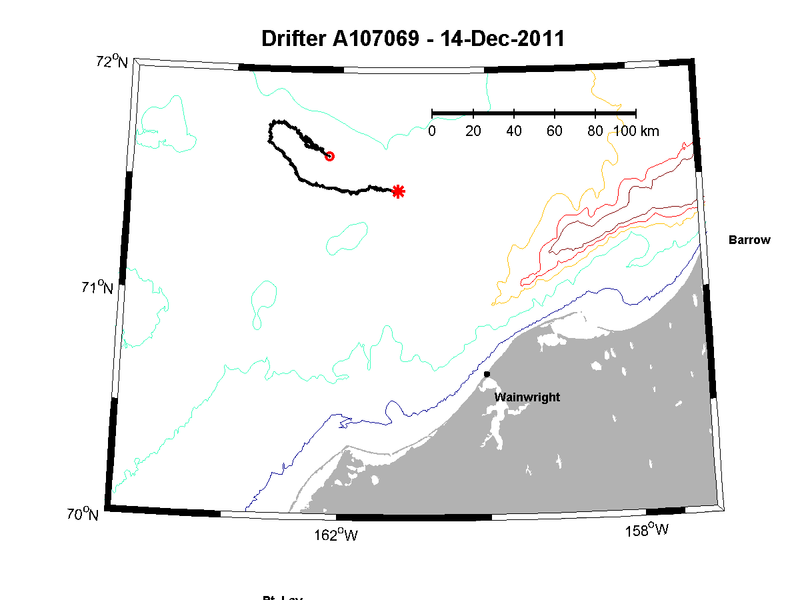 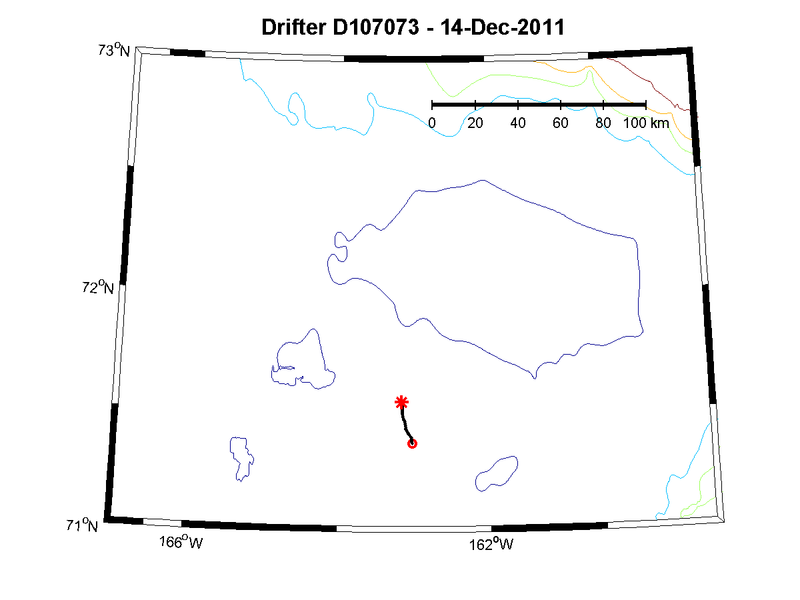 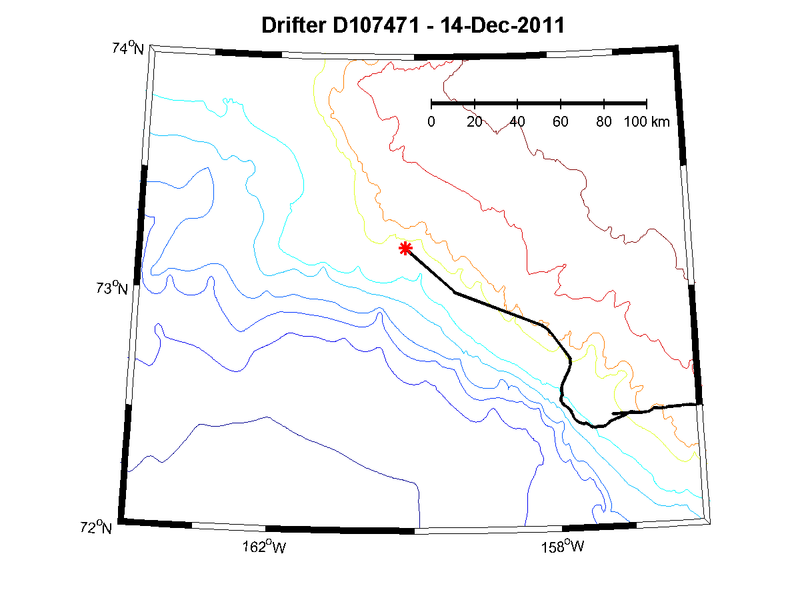 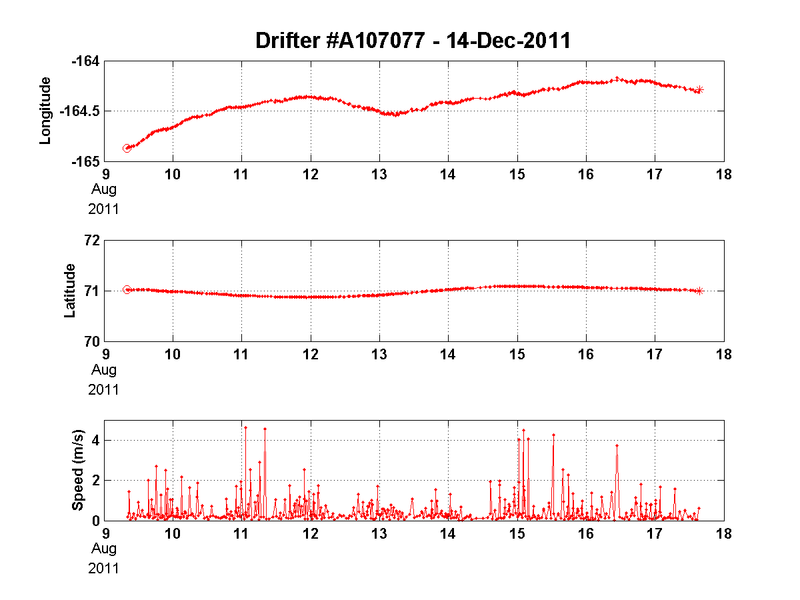 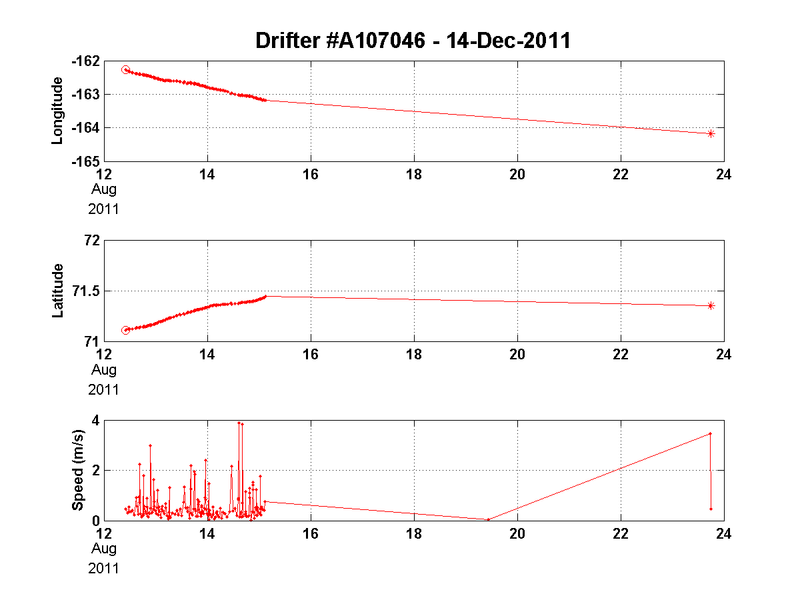 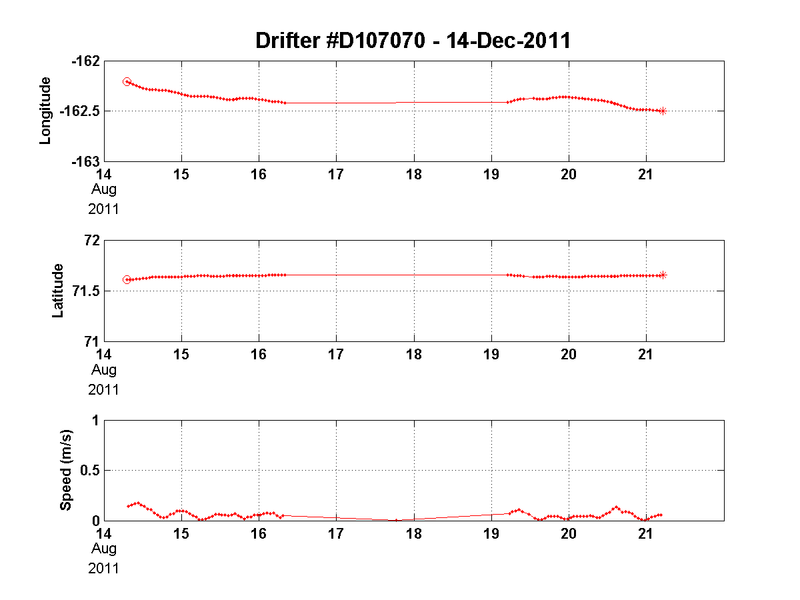 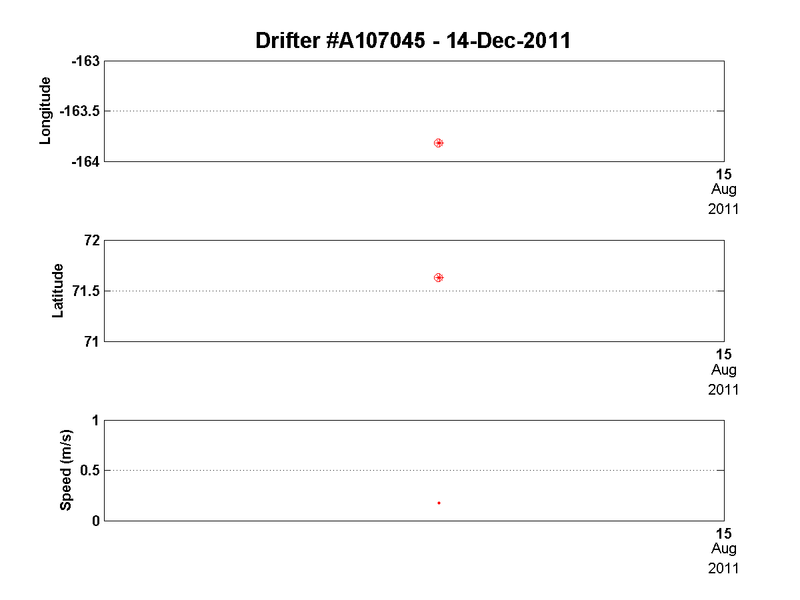 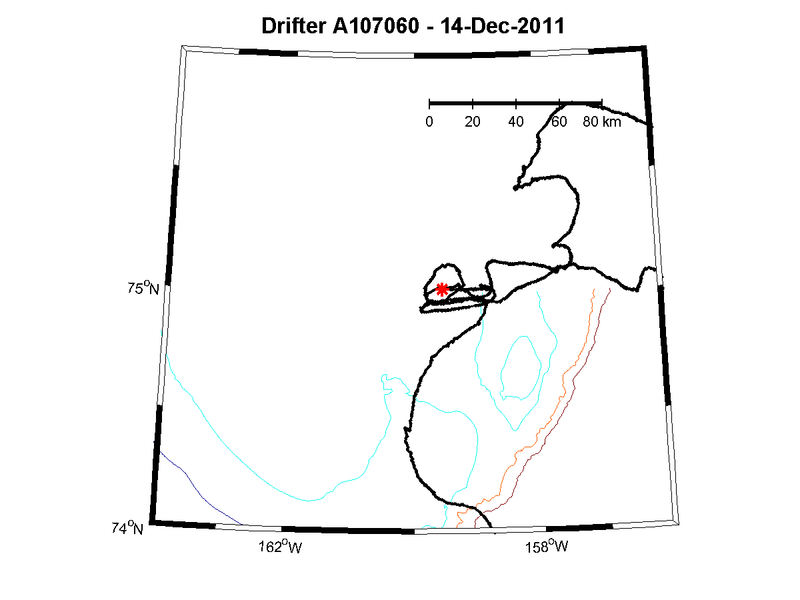 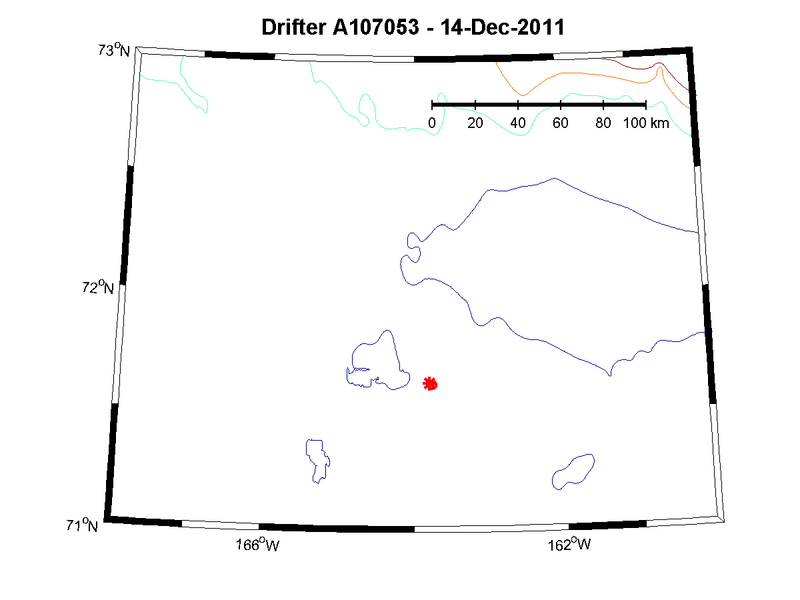 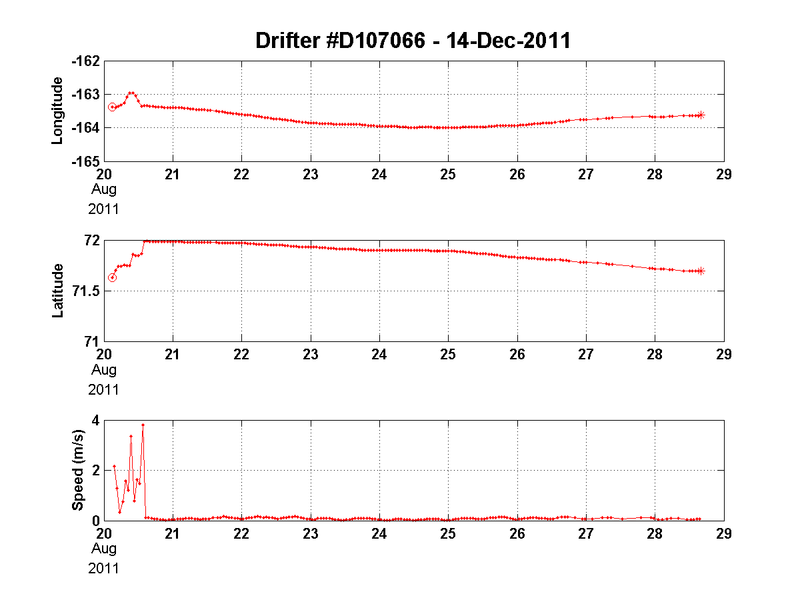 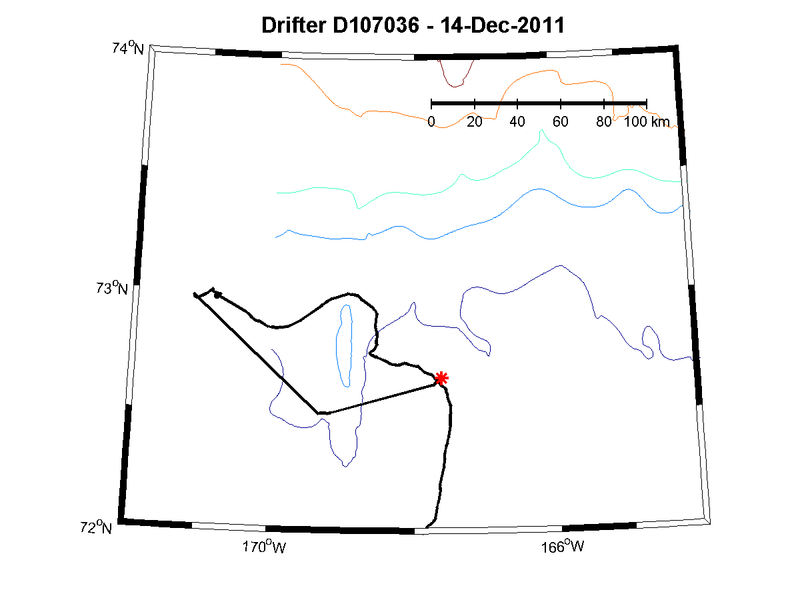 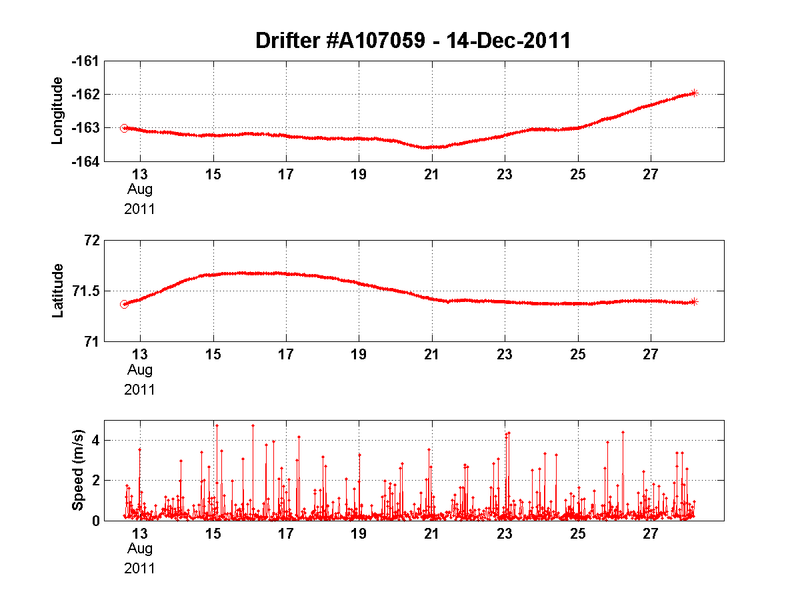 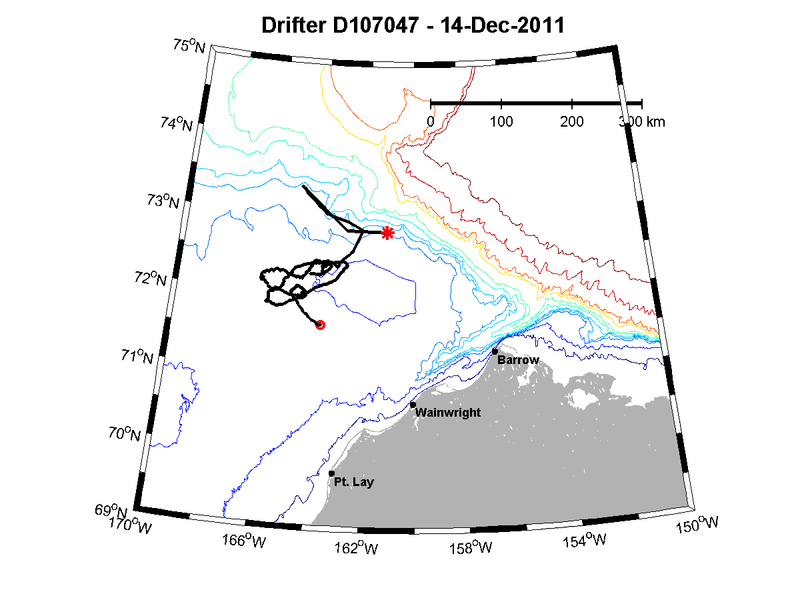 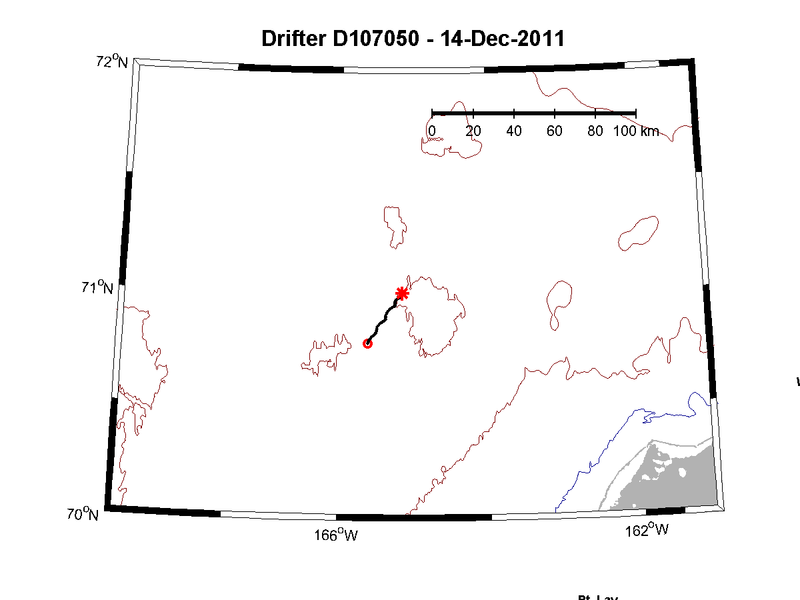 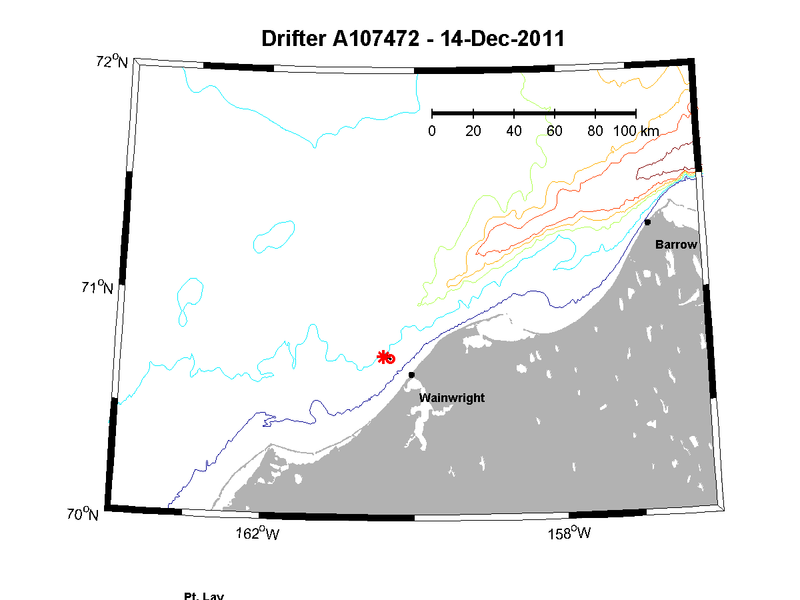 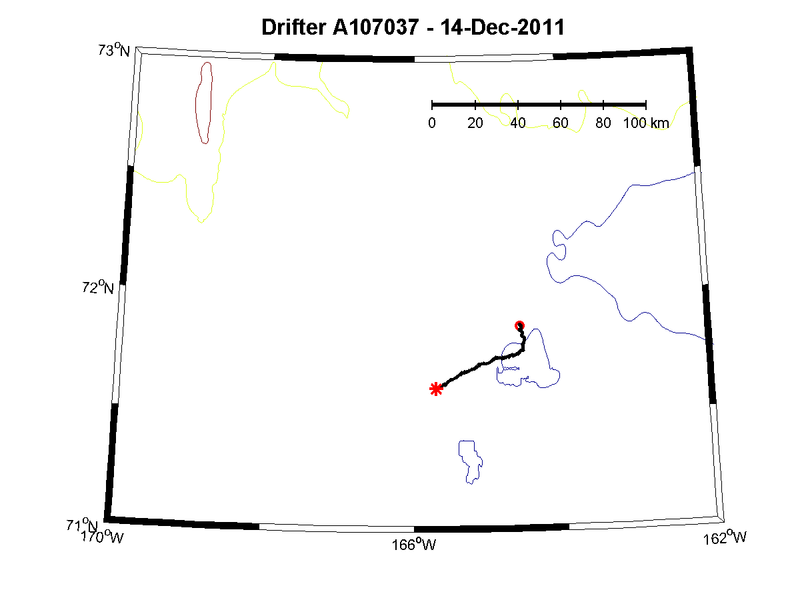 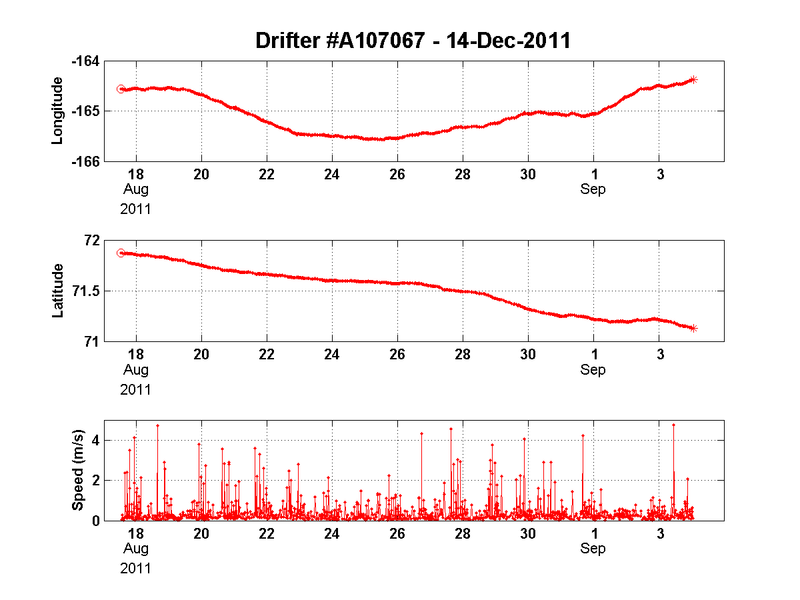 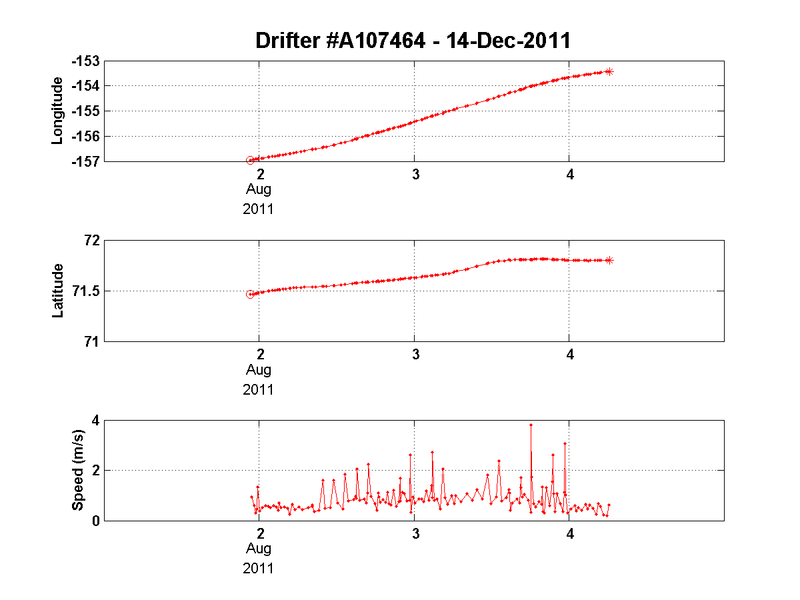 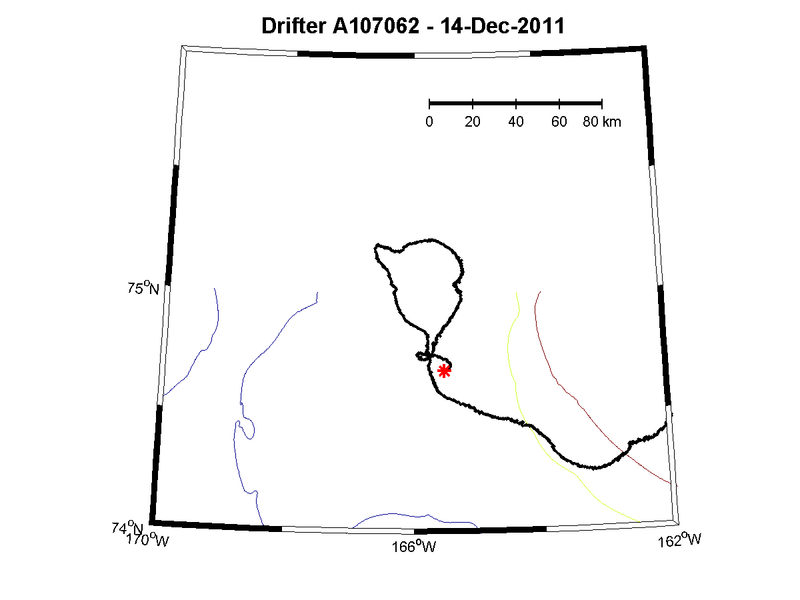 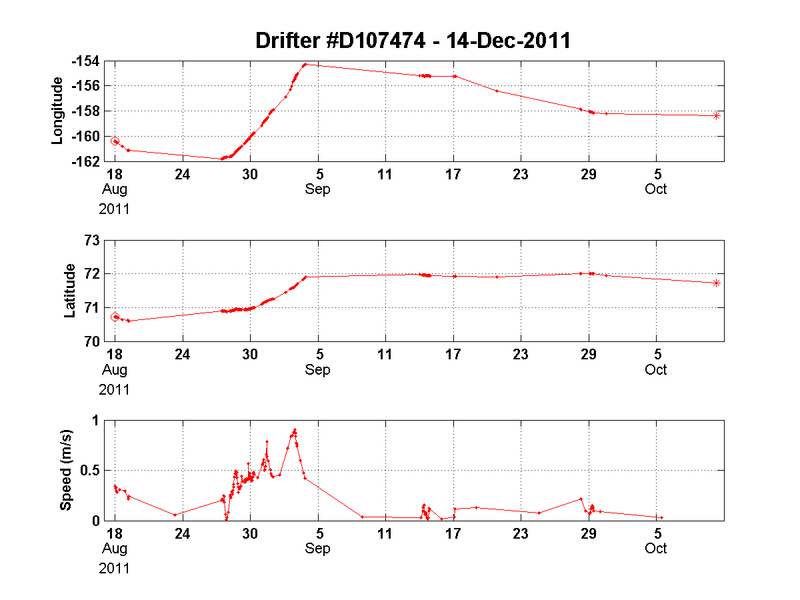 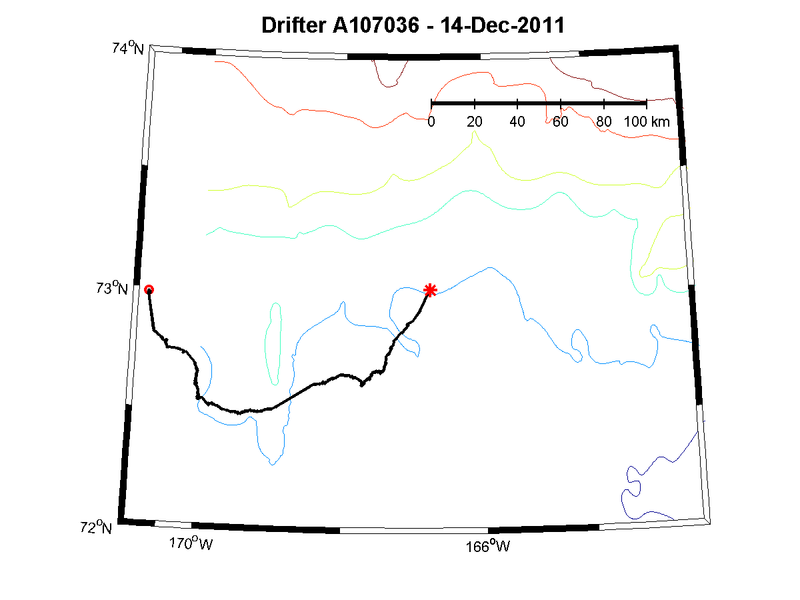 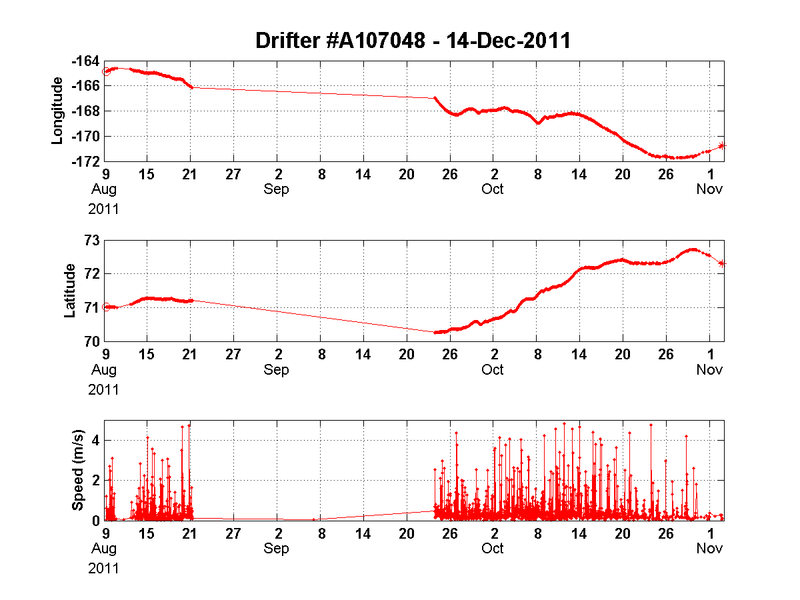 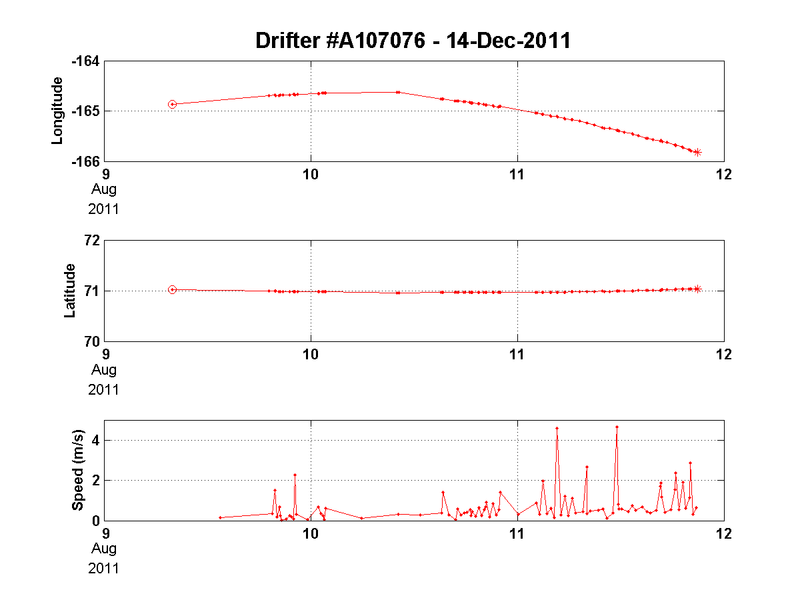 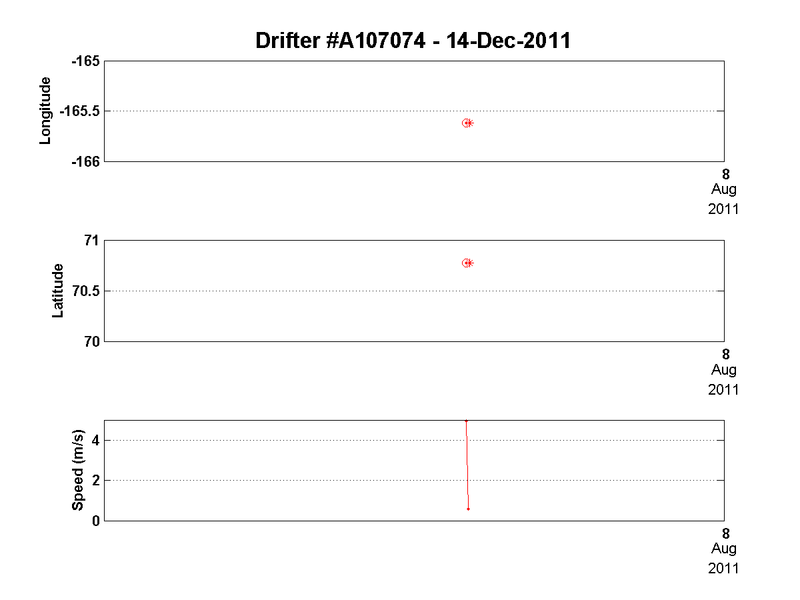 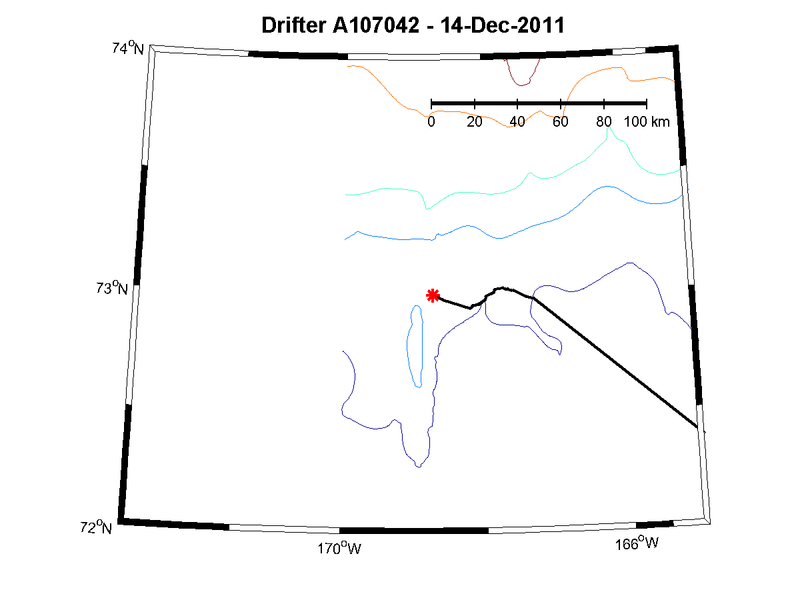 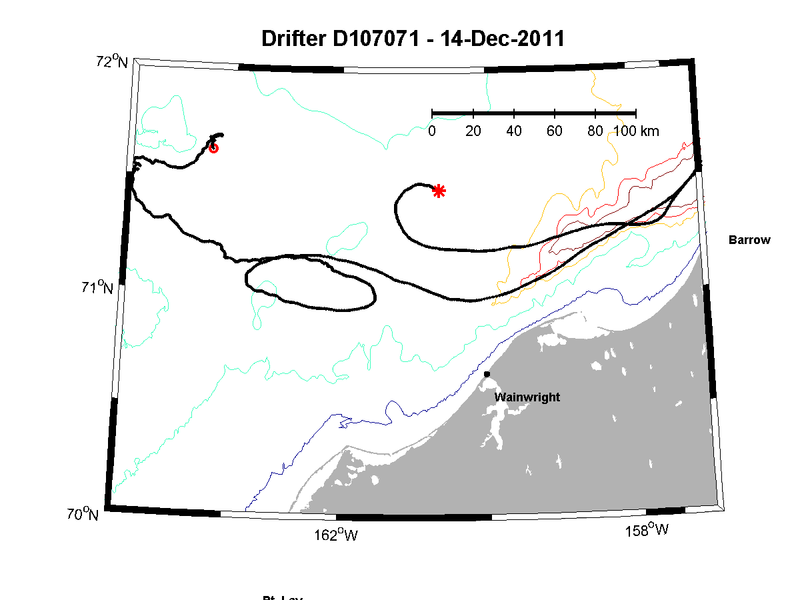 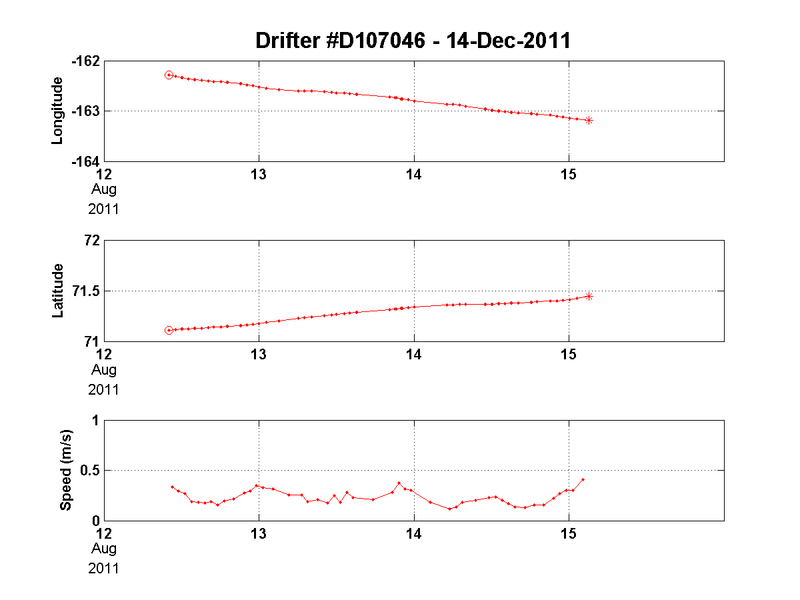 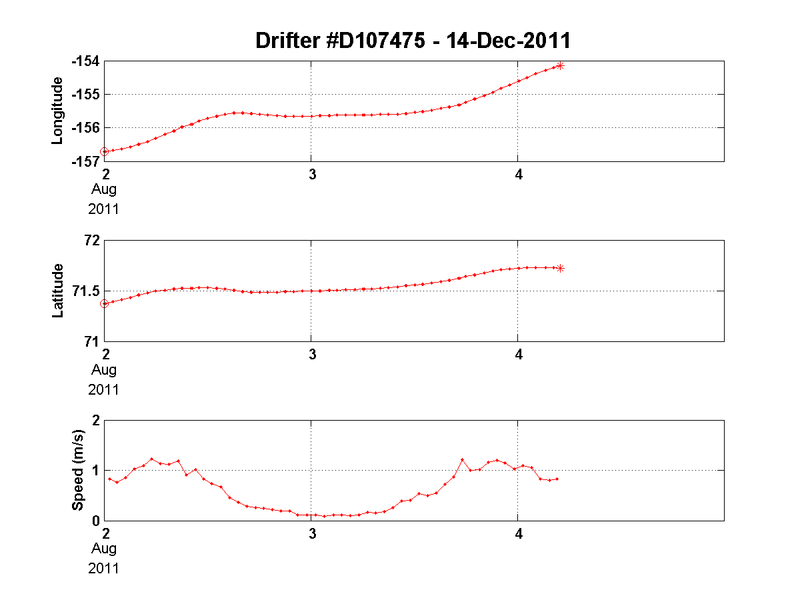 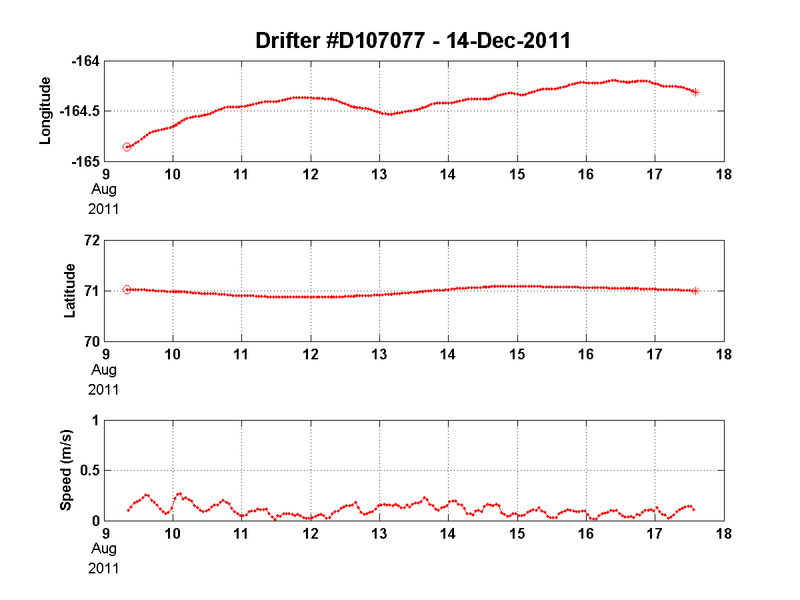 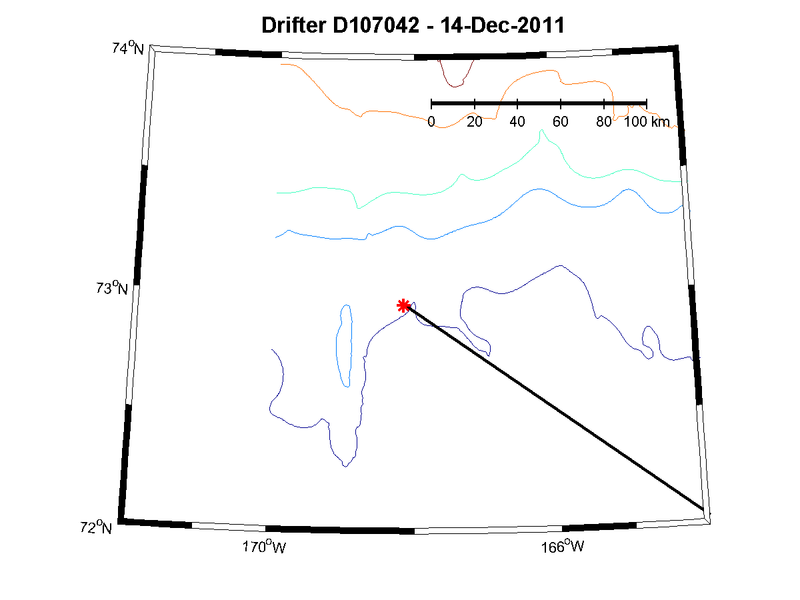 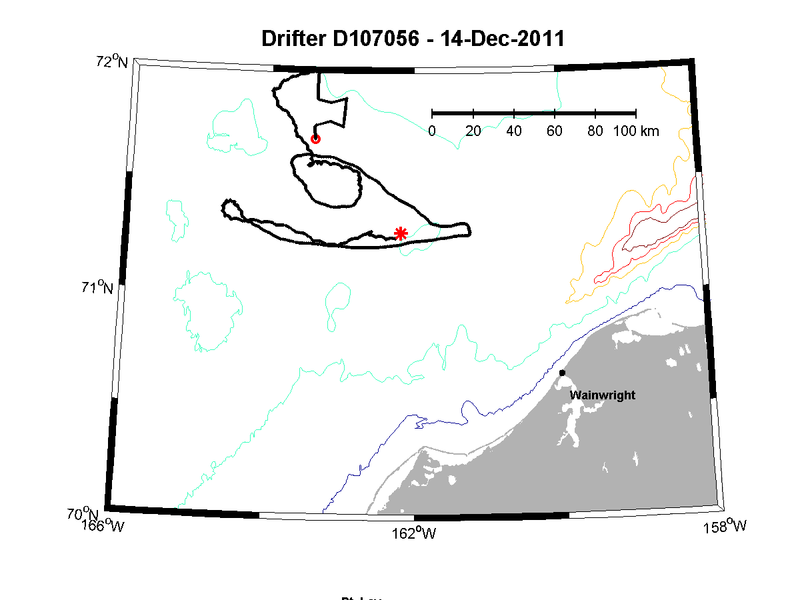 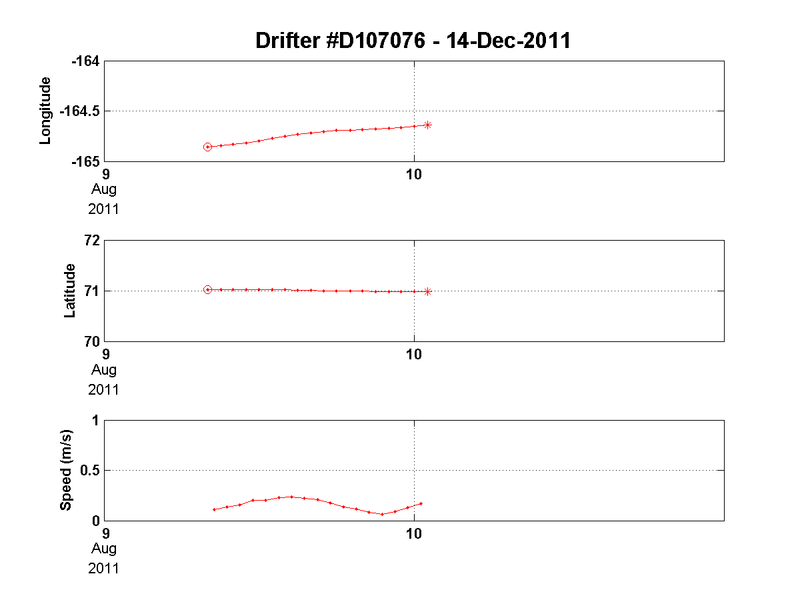 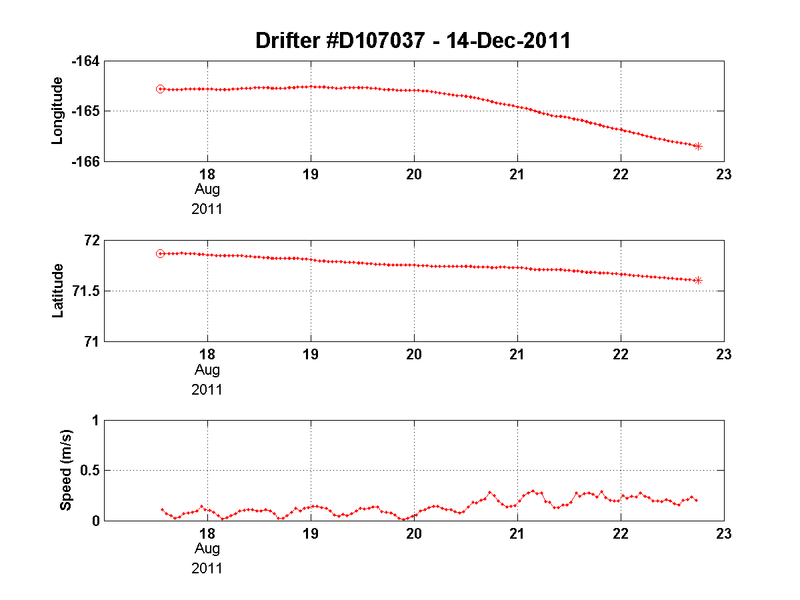 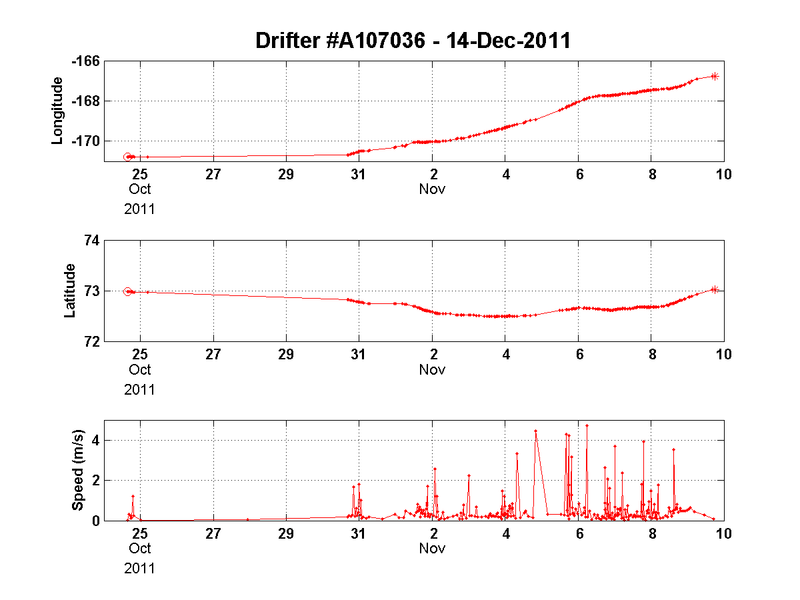 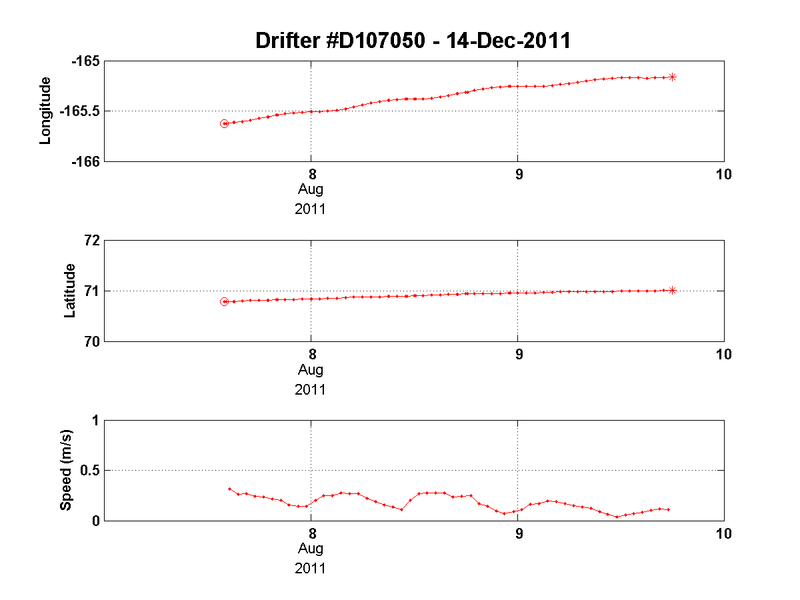 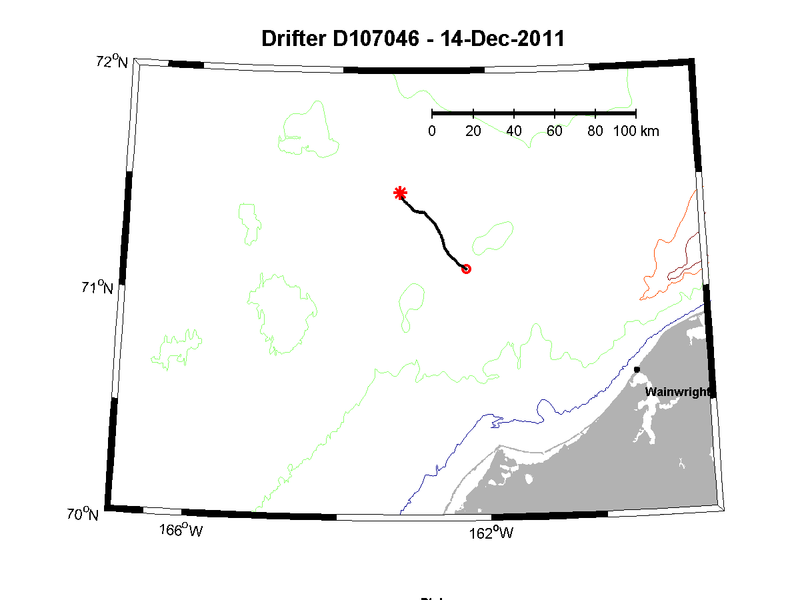 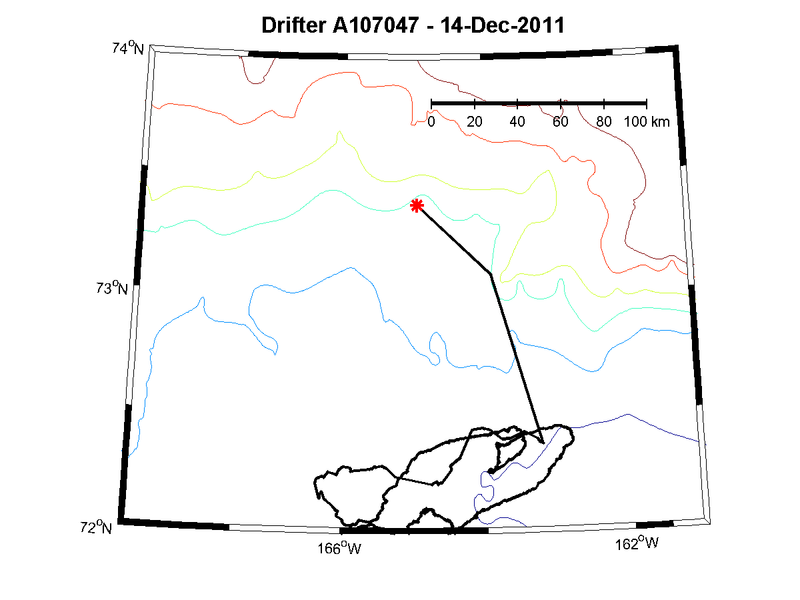 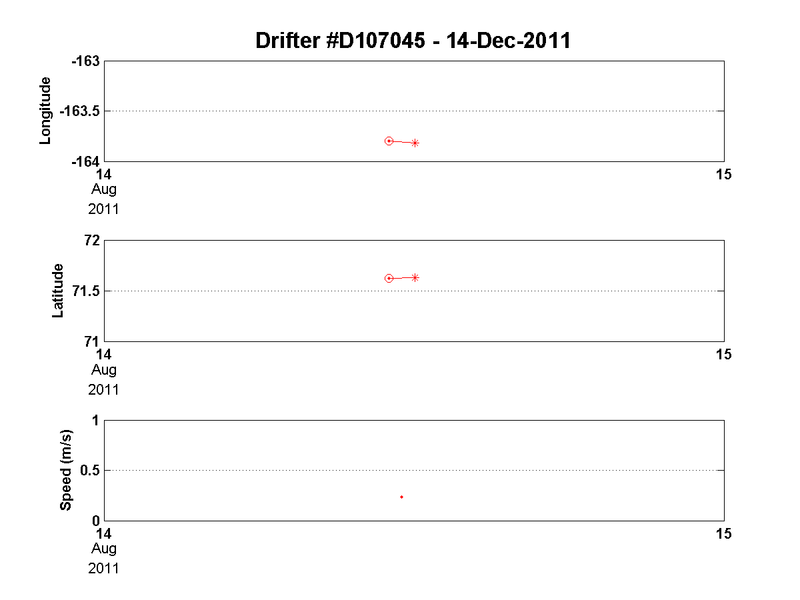 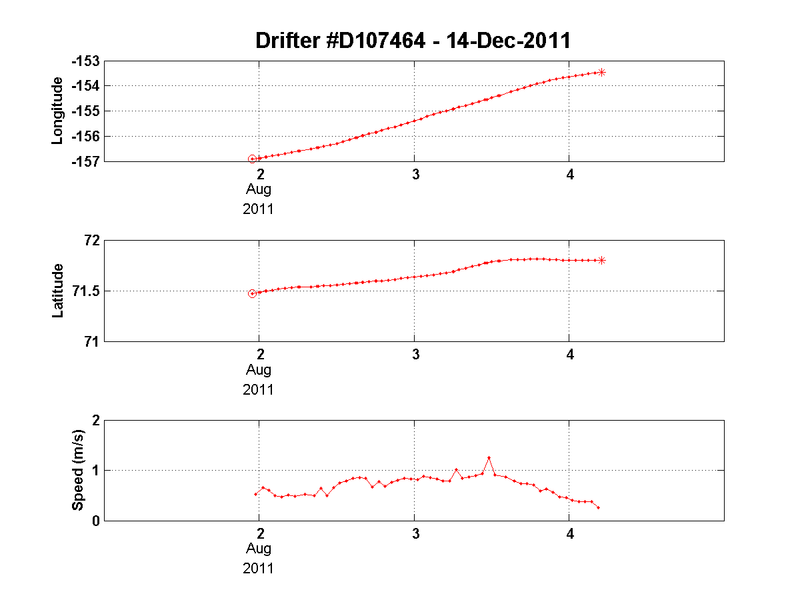 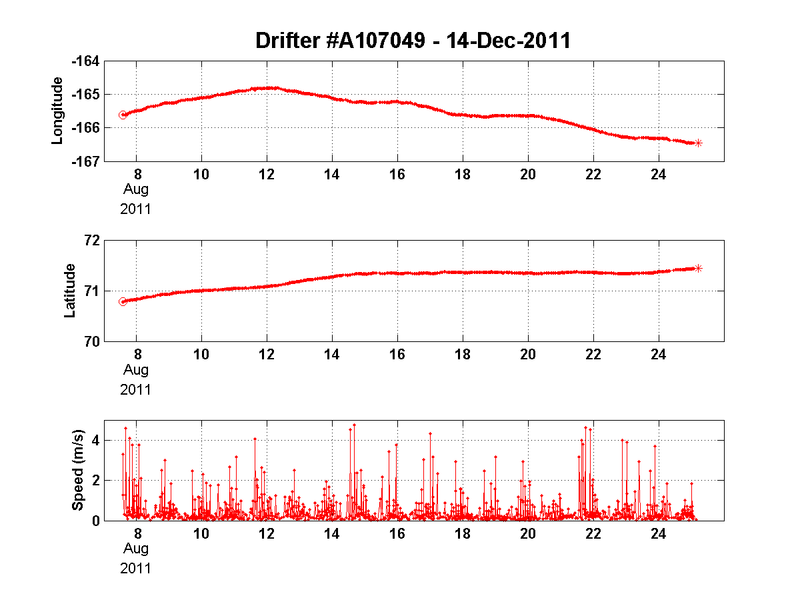 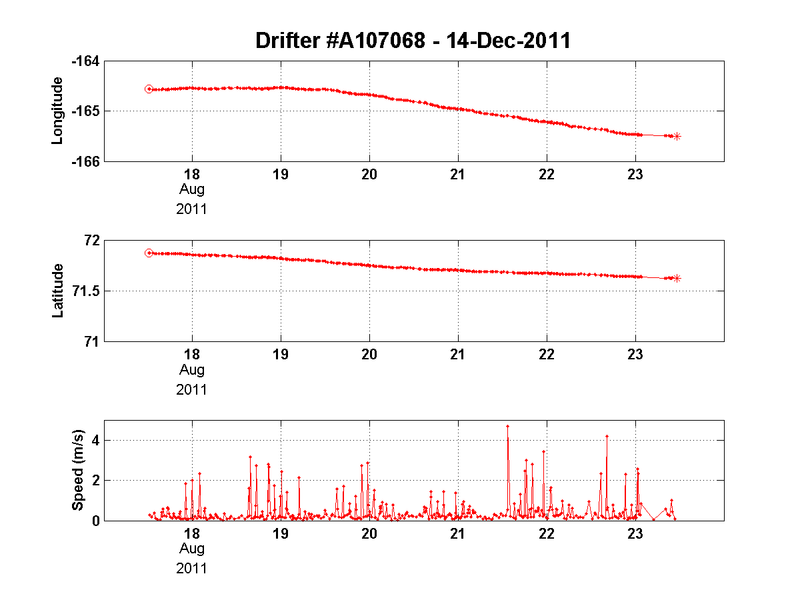 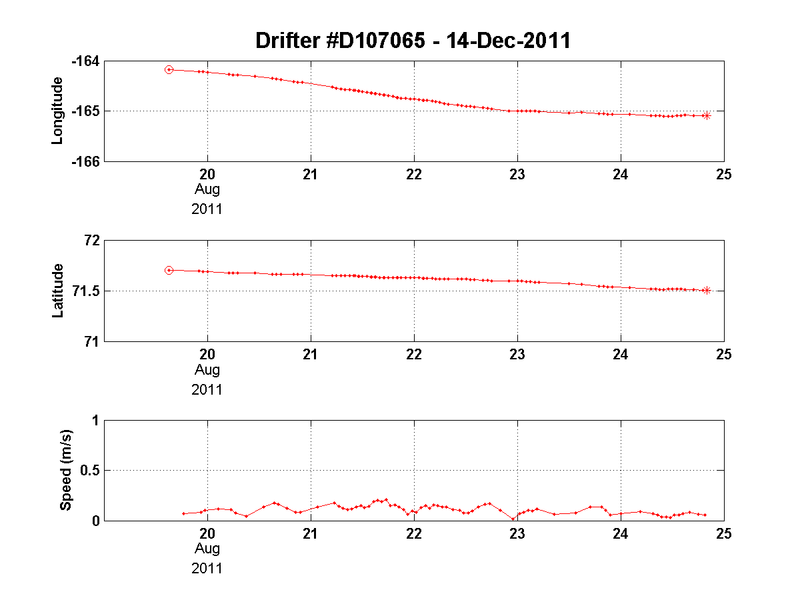 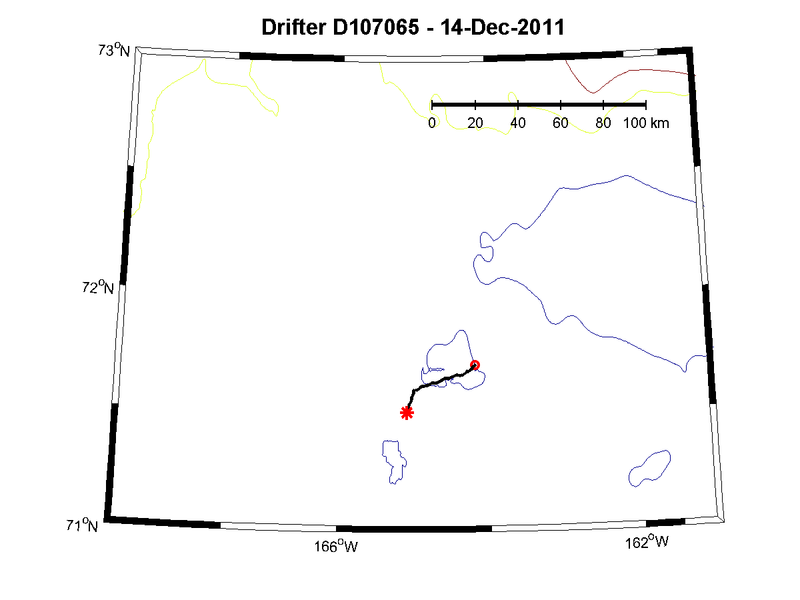 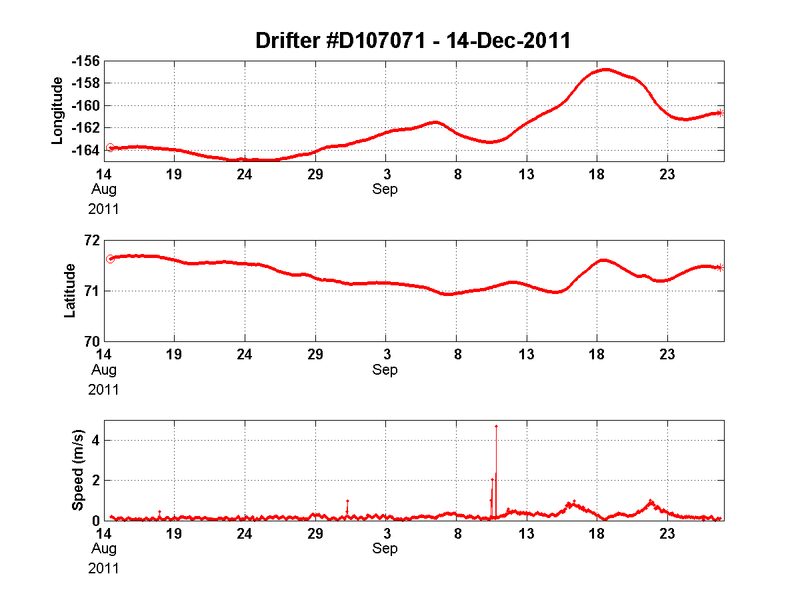 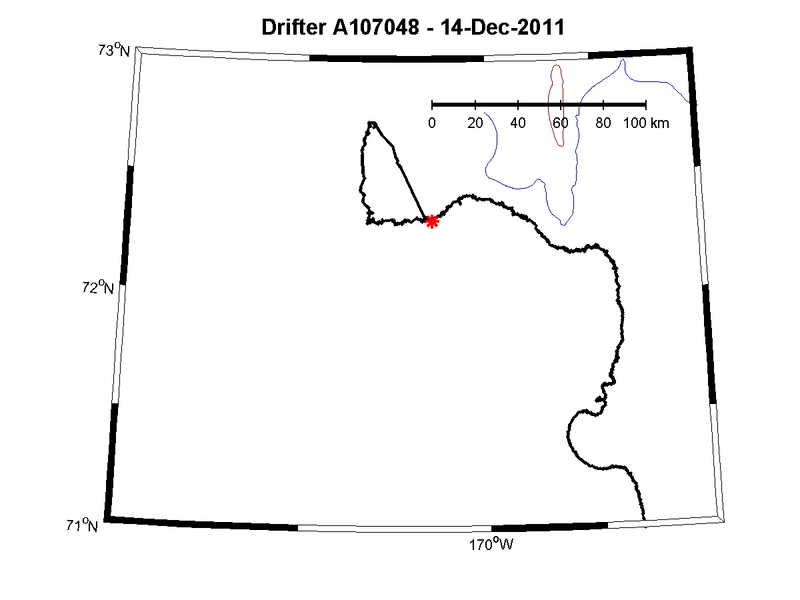 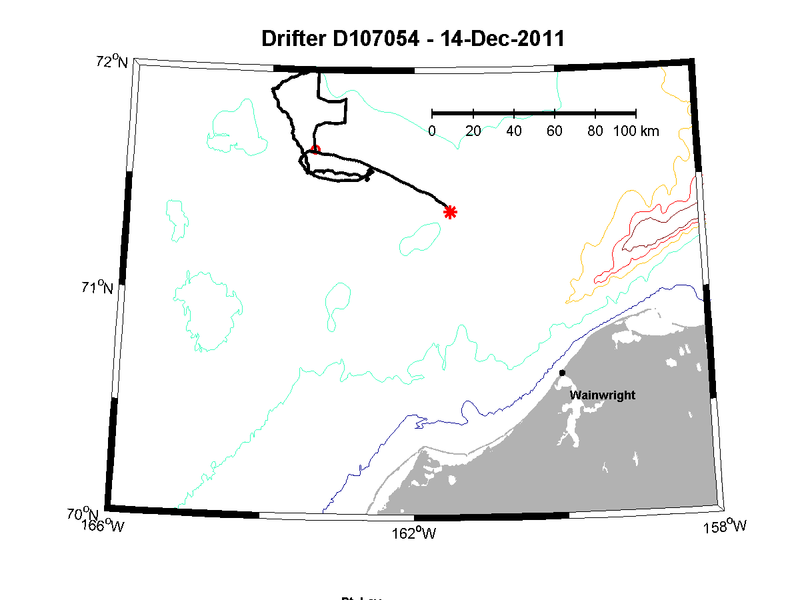 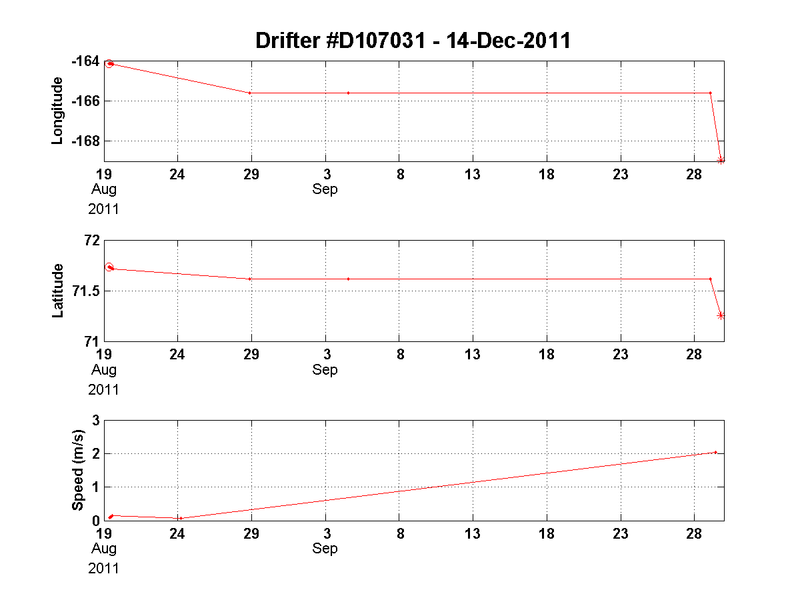 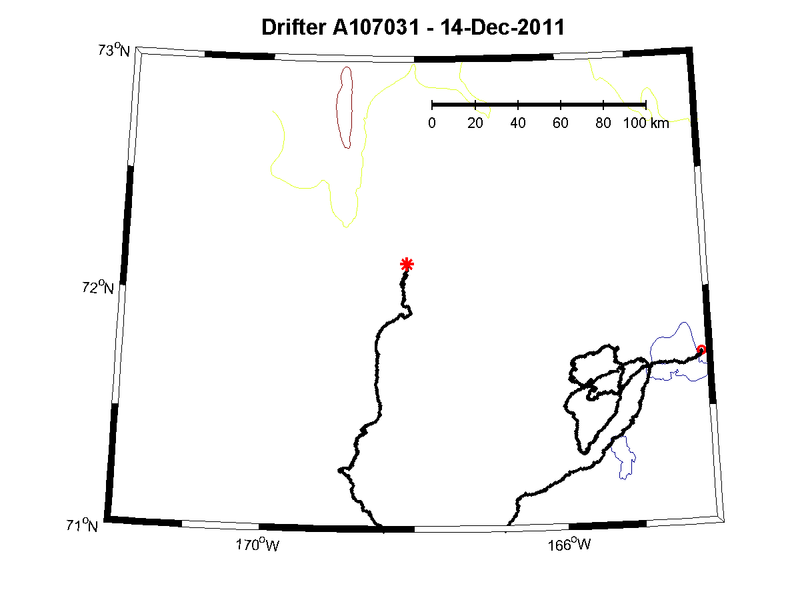 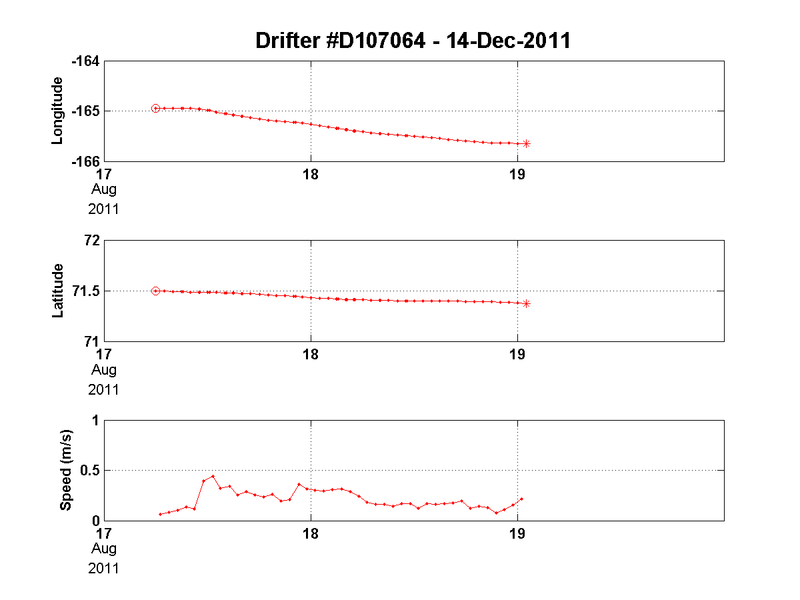 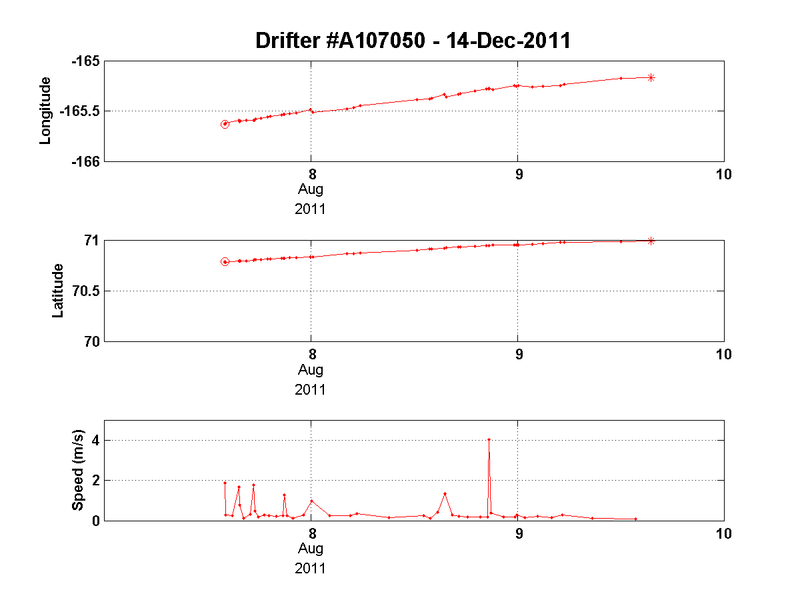 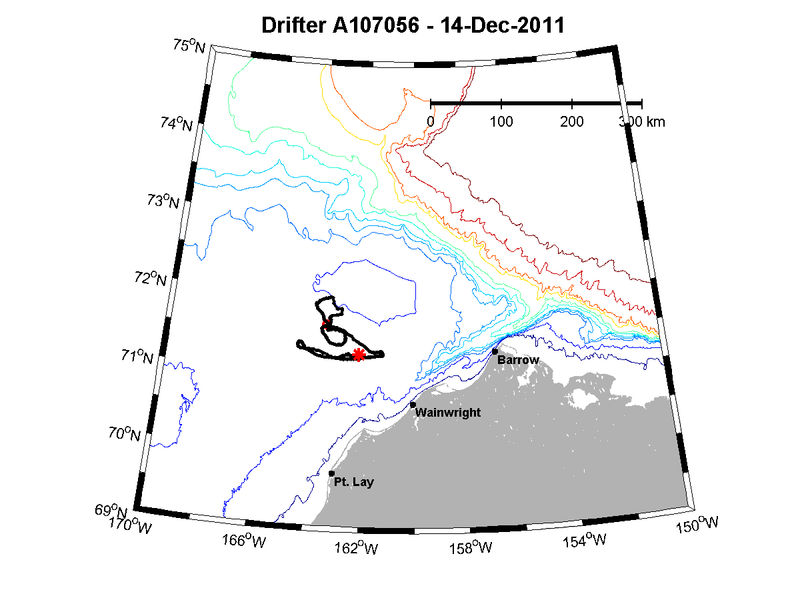 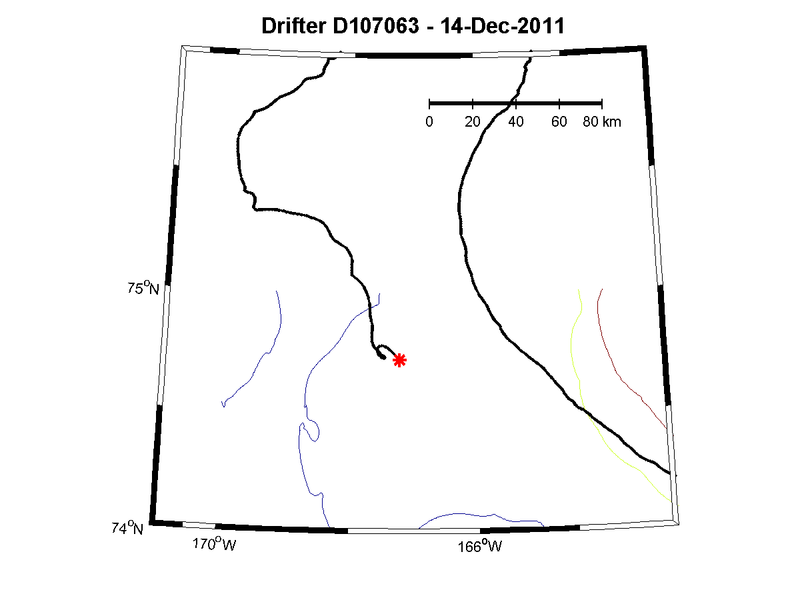 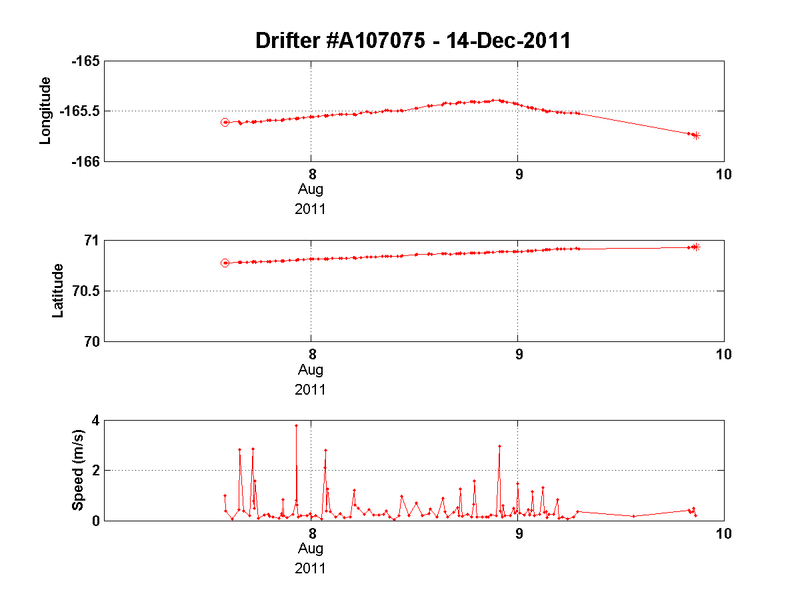 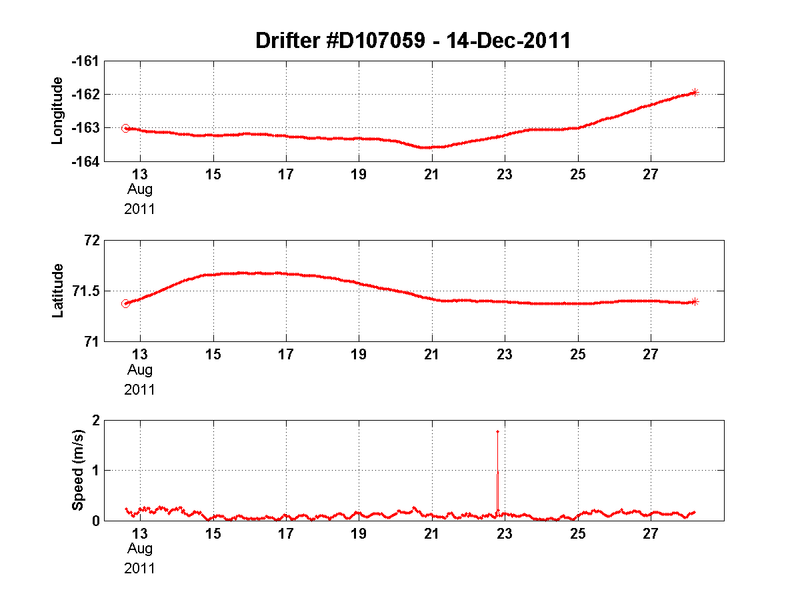 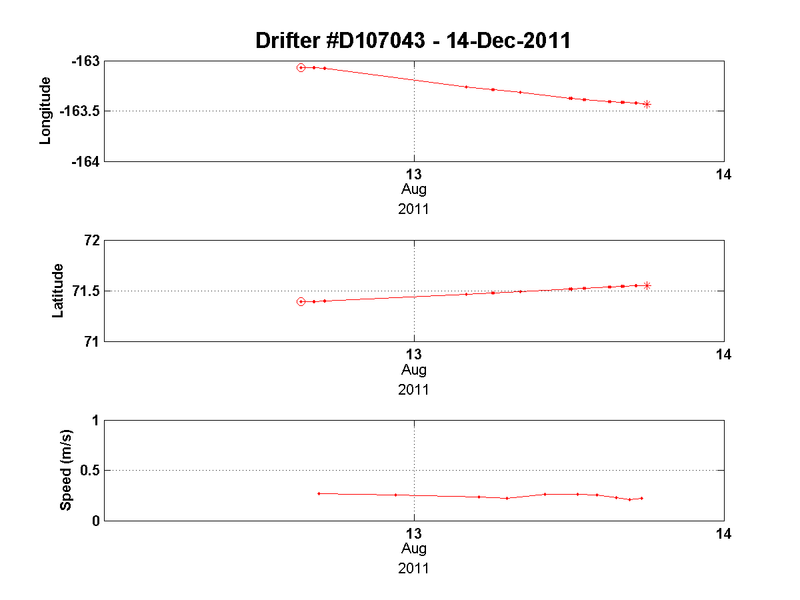 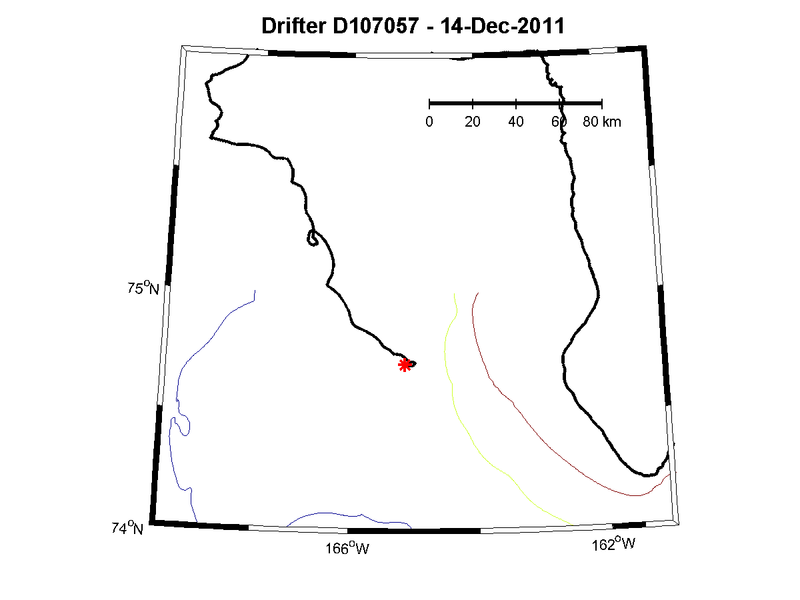 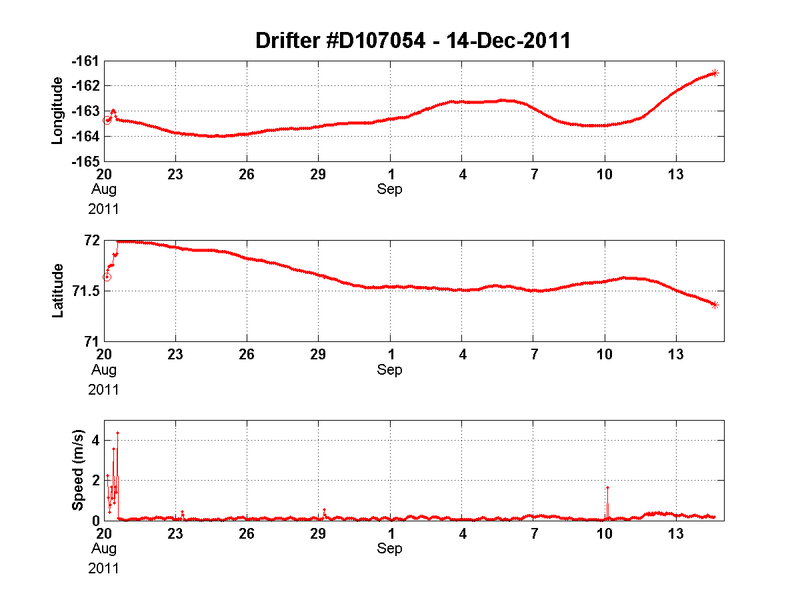 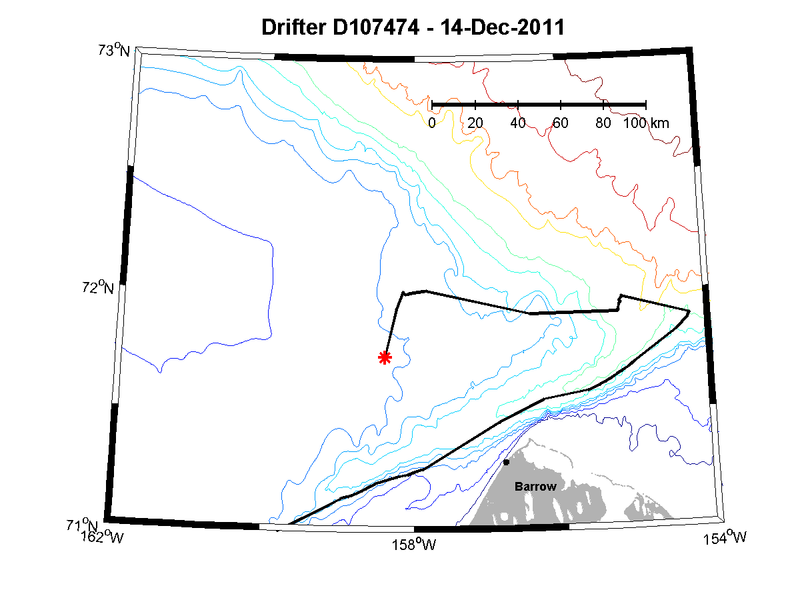 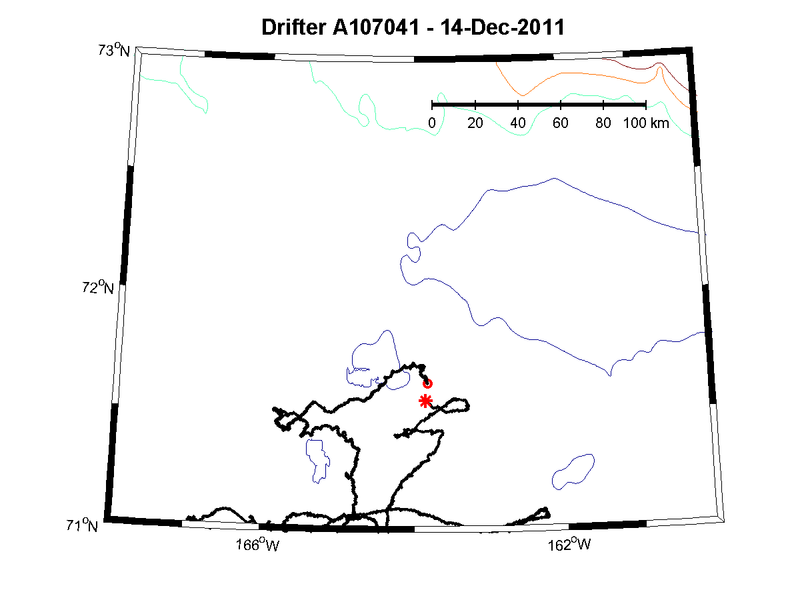 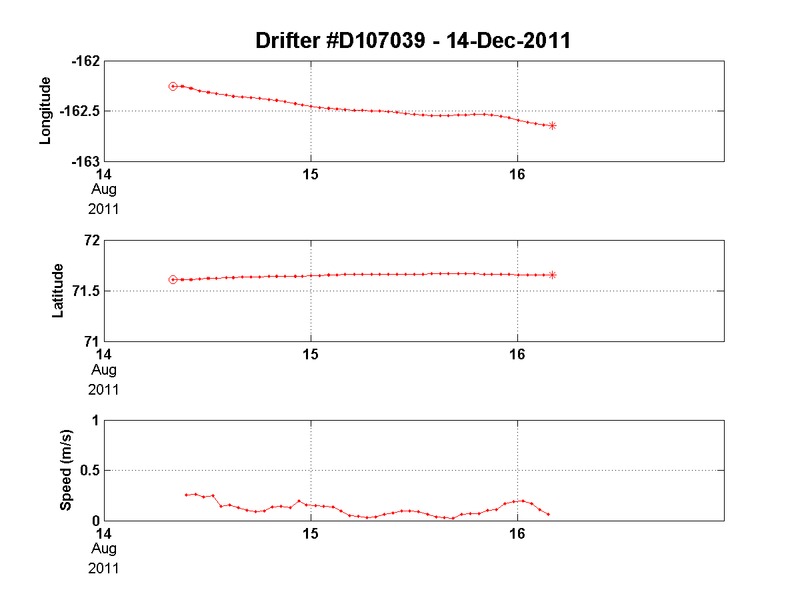 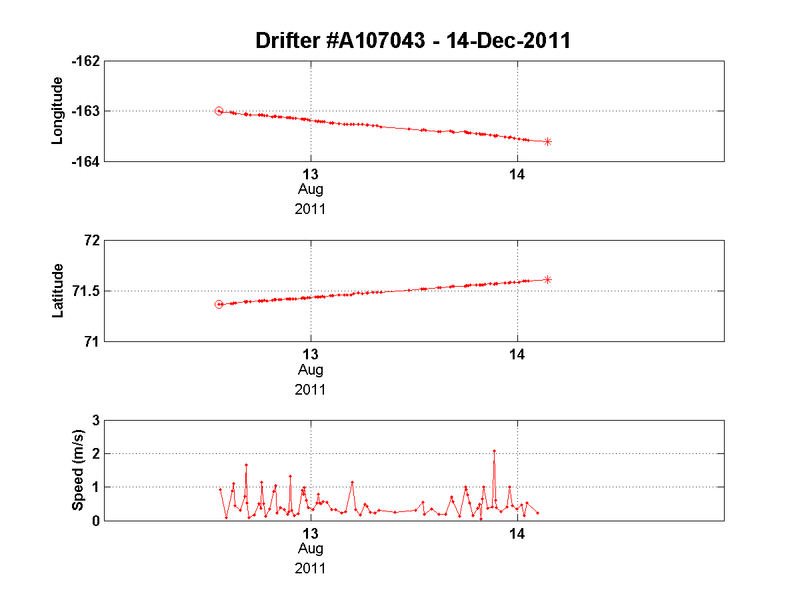 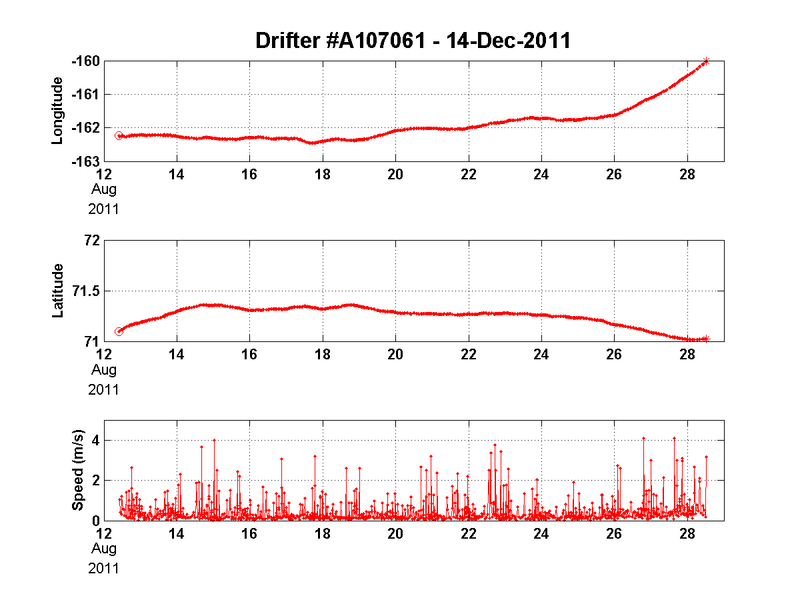 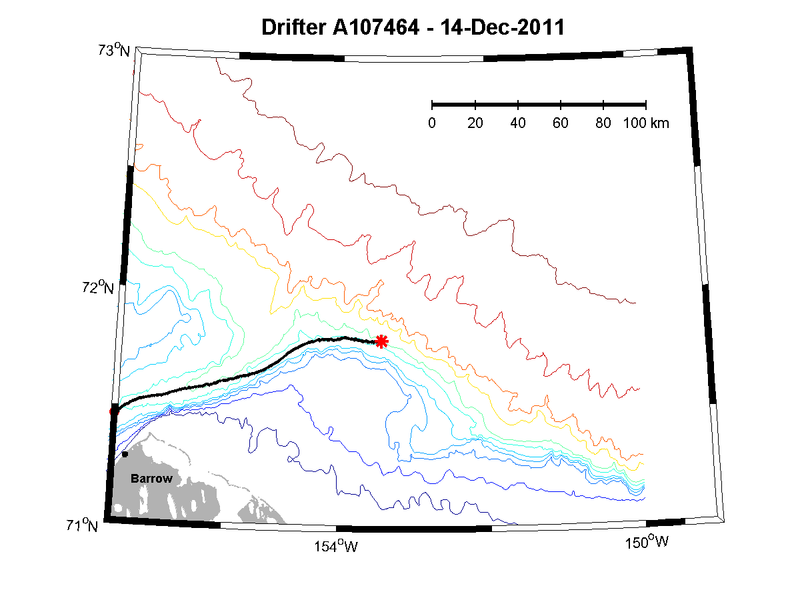 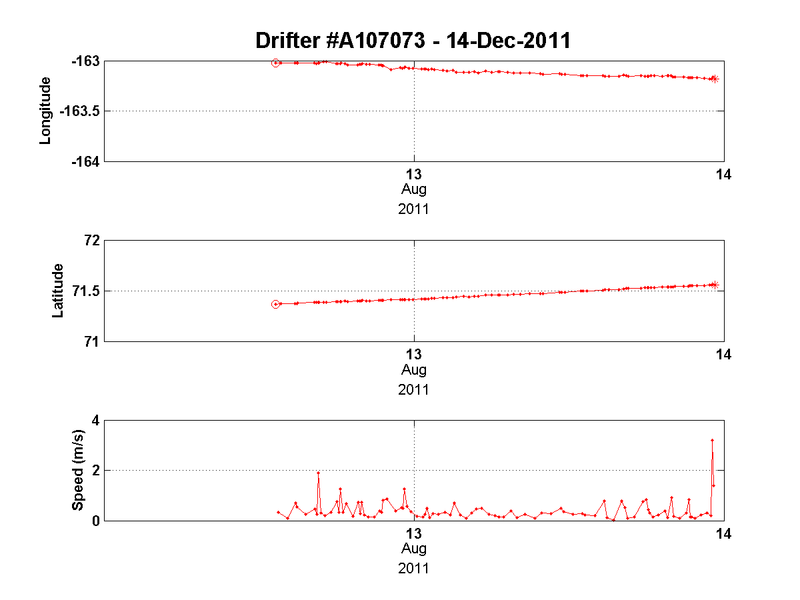 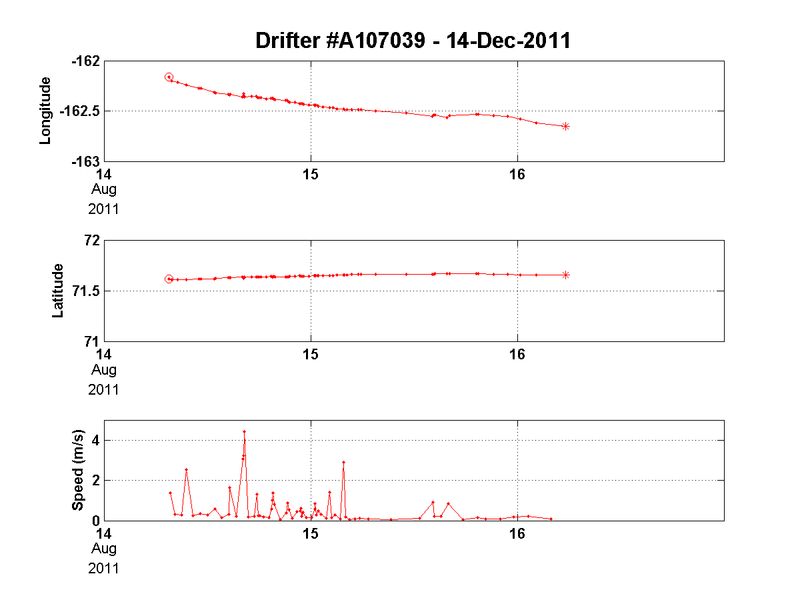 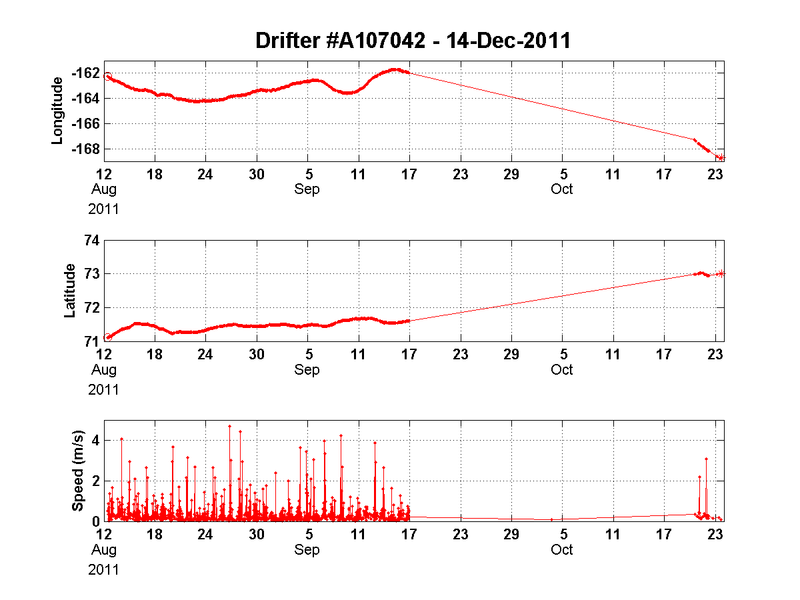 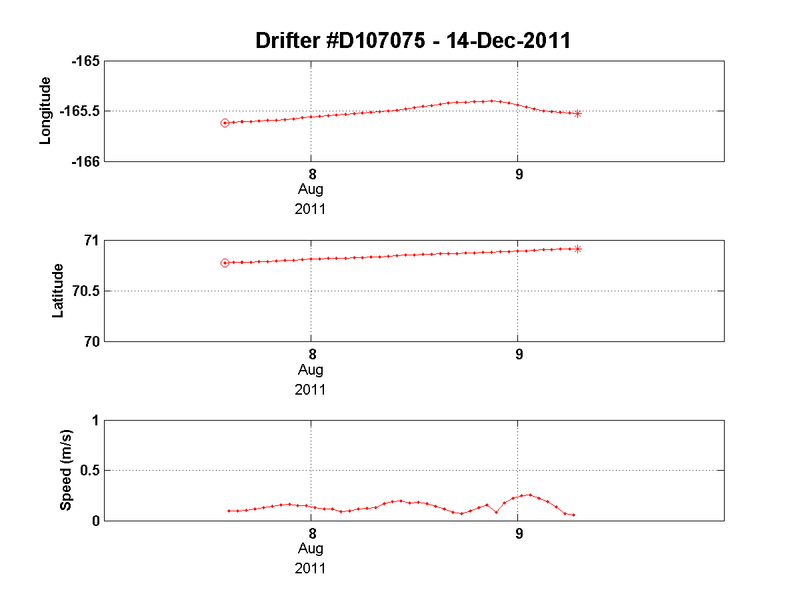 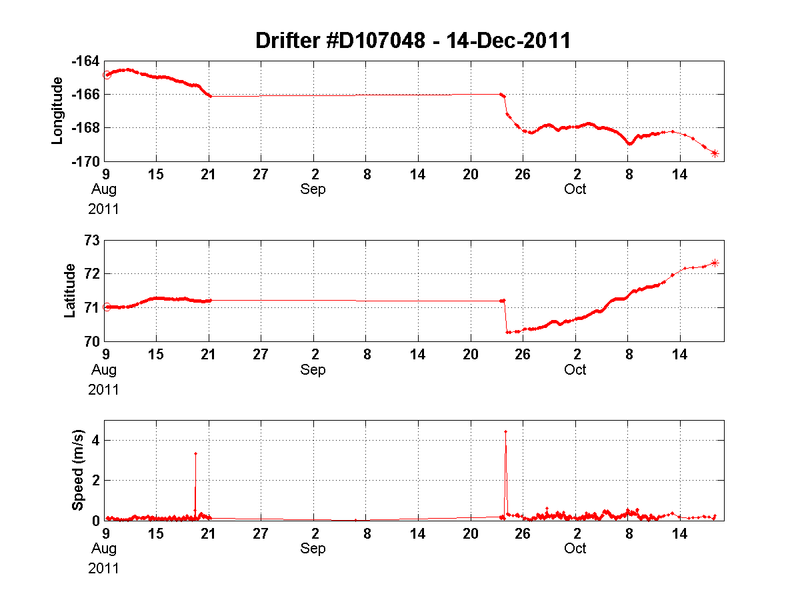 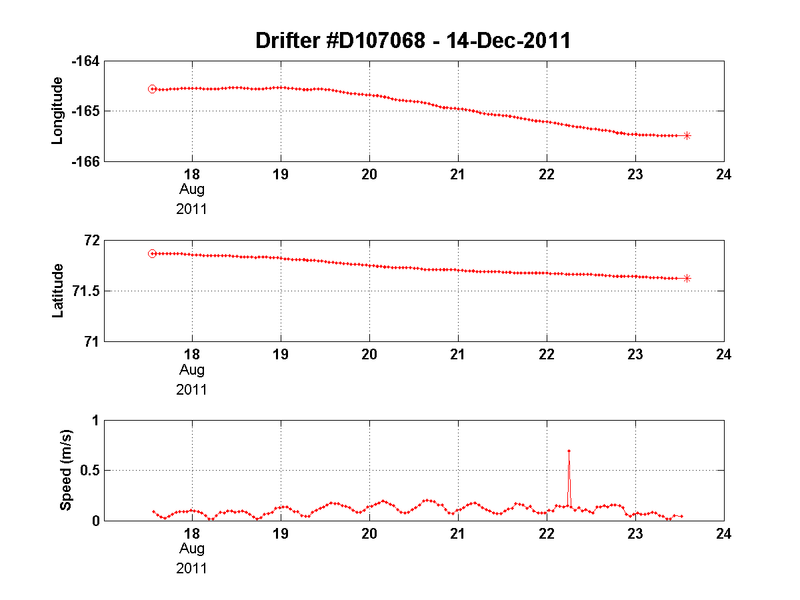 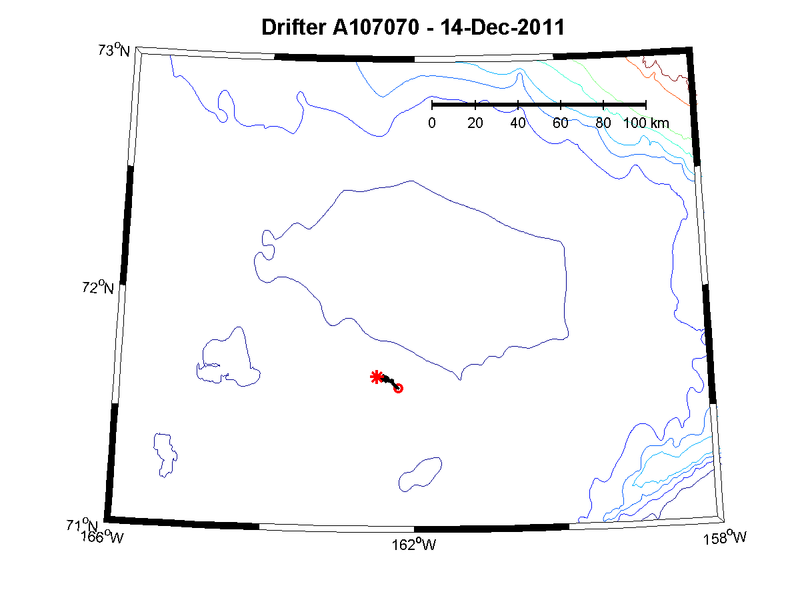 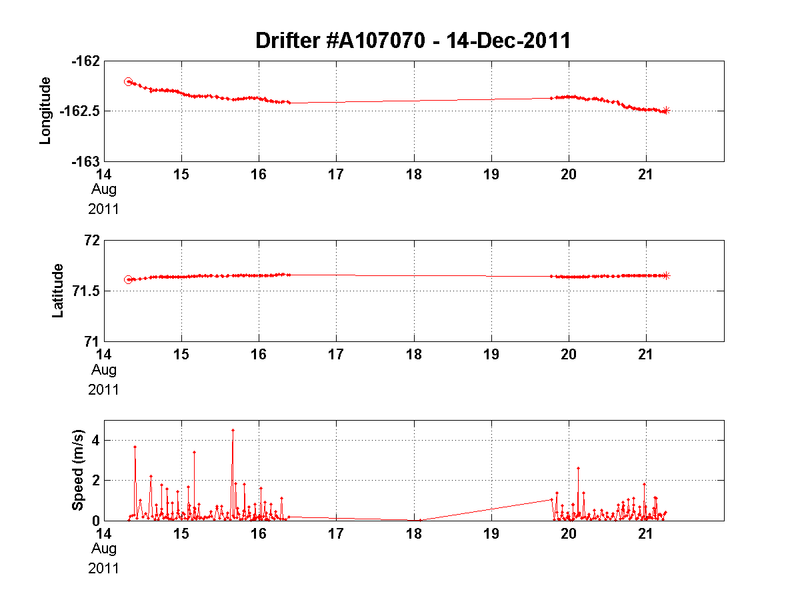 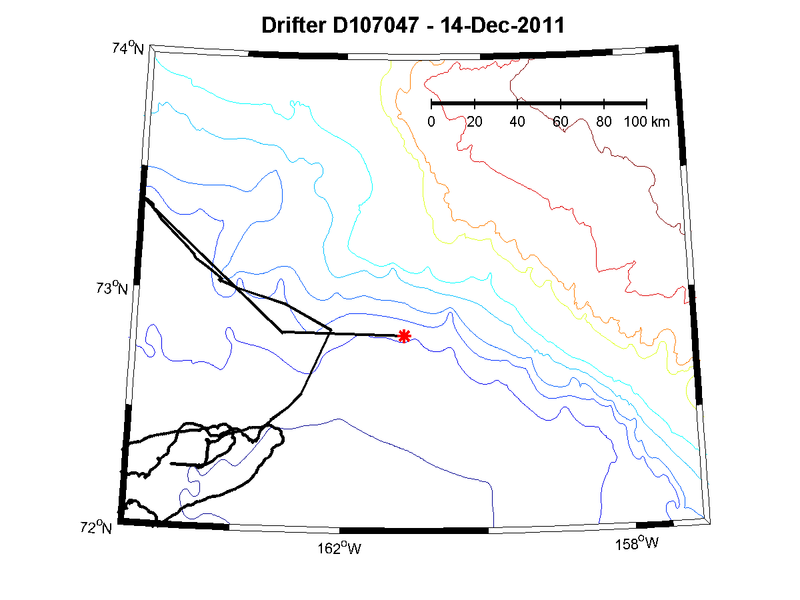 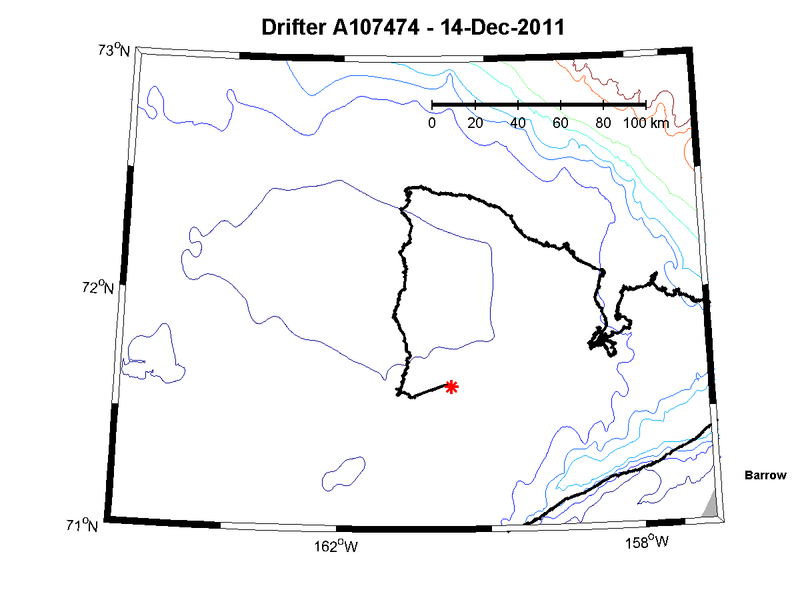 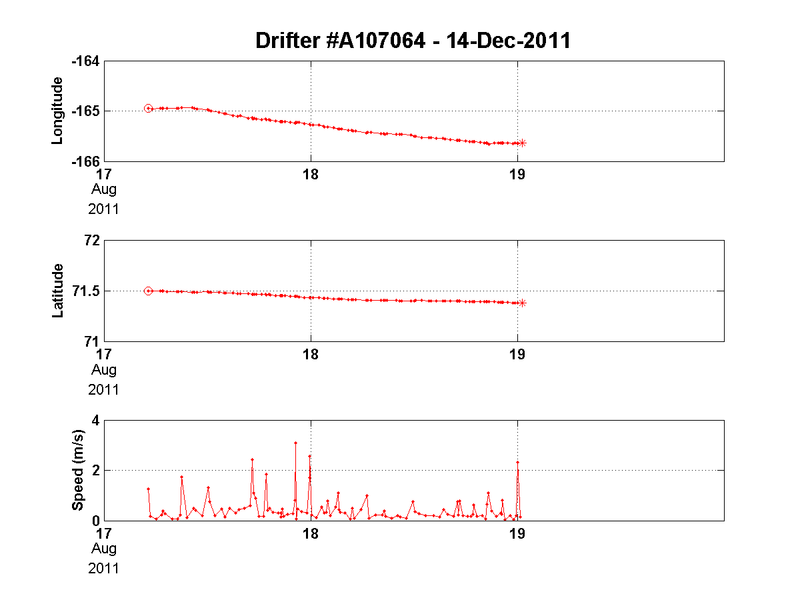 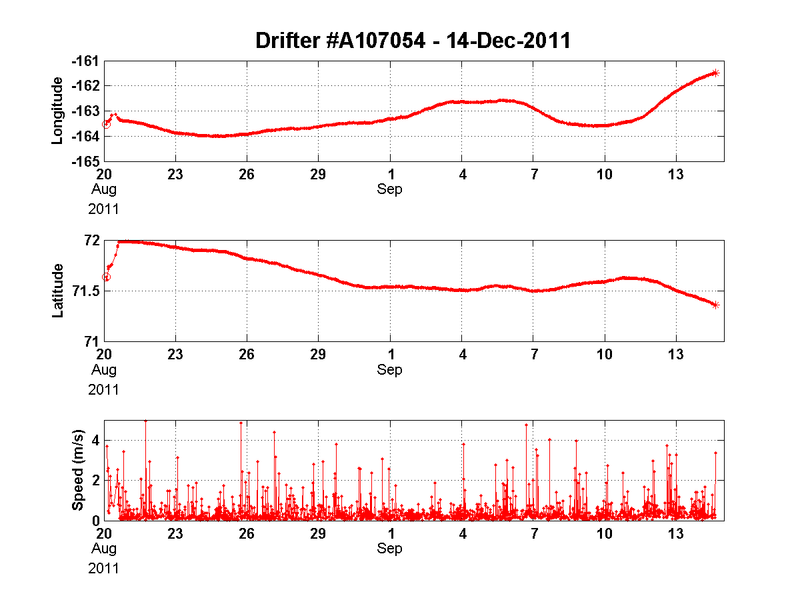 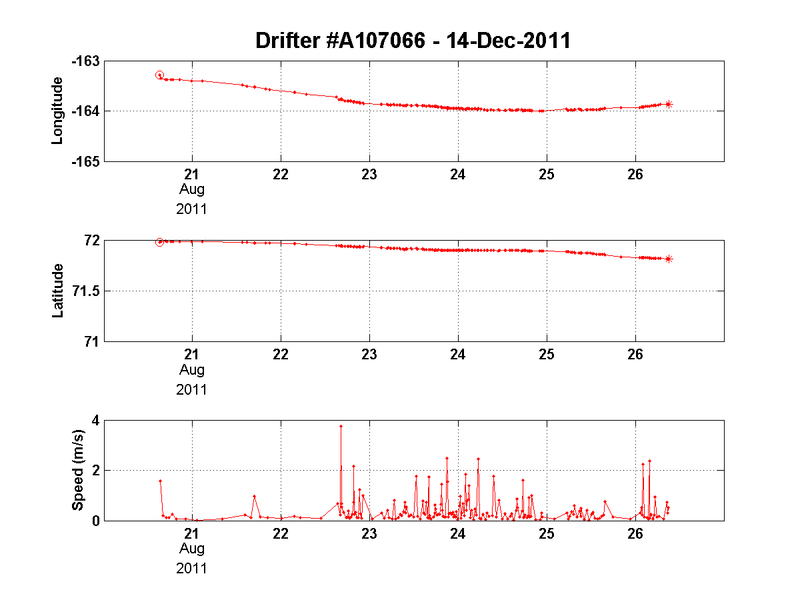 The sampling involves co-located deployments of WOCE (10 m drogue) and CODE (1 m drogue) drifters to ascertain the surface and near surface circulation. 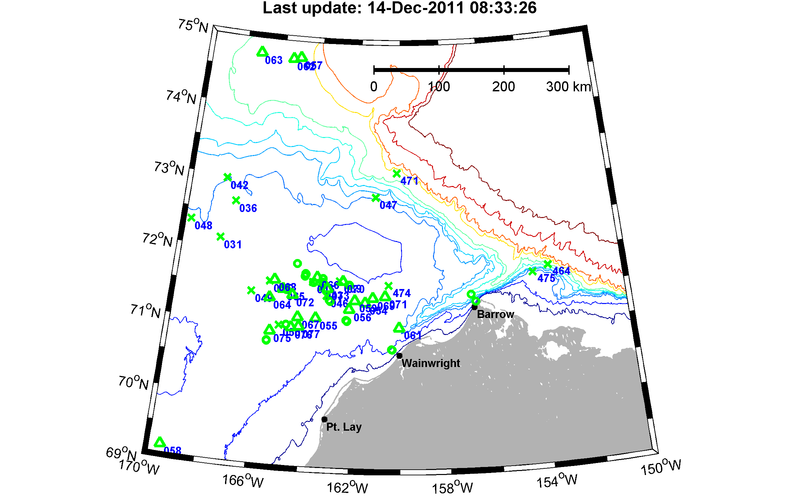 These cluster deployments will allow us to better understand current shear in the upper ocean and its relation to seasonal changes in stratification and winds. 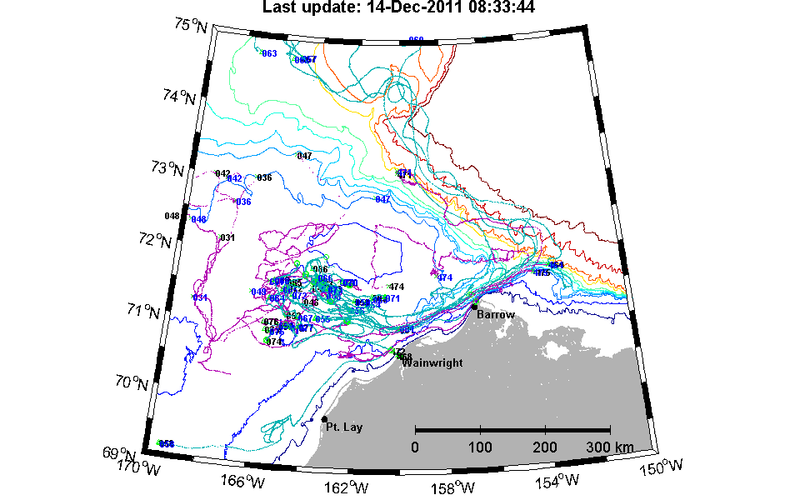 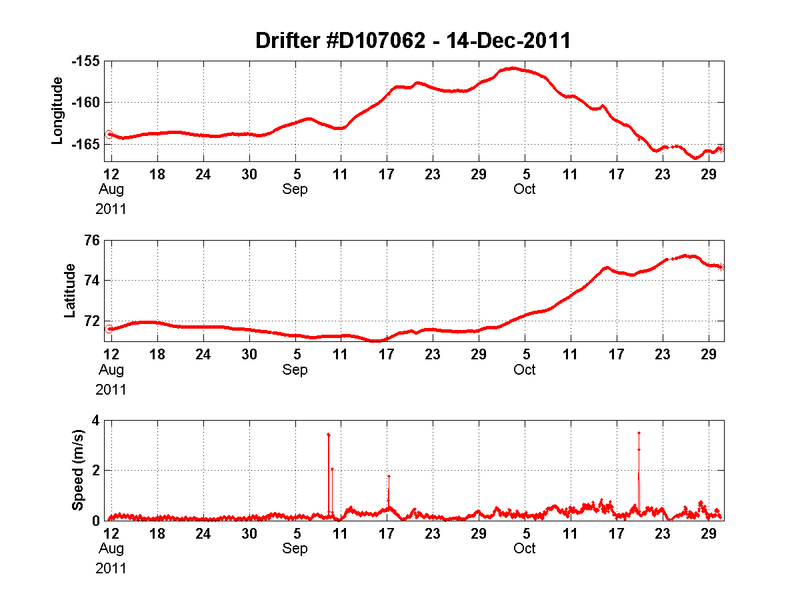 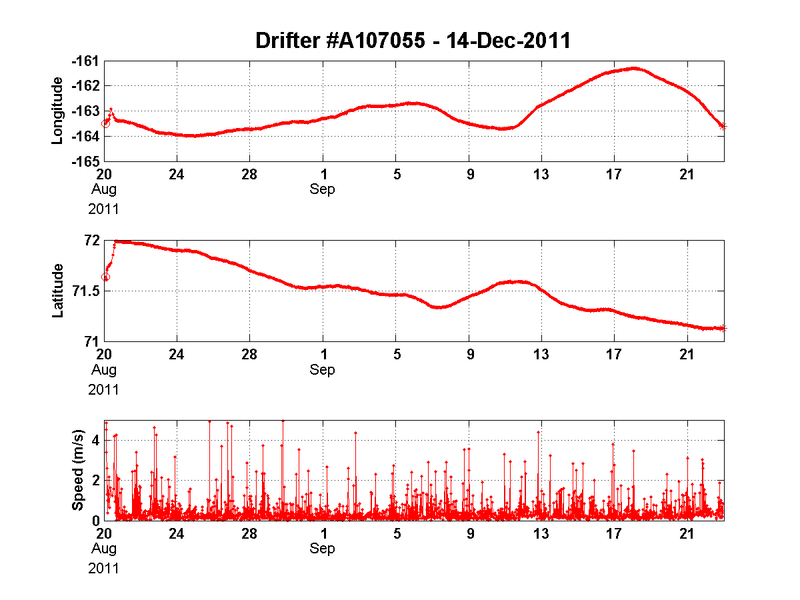 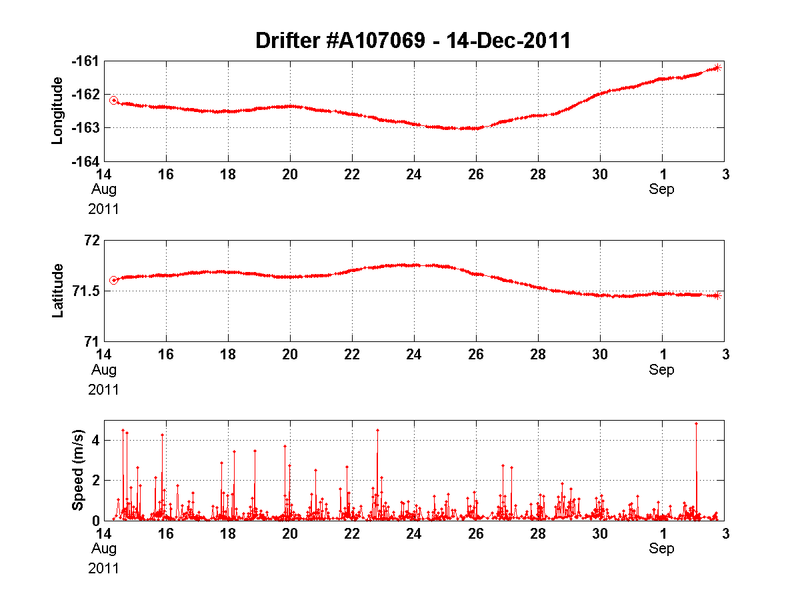 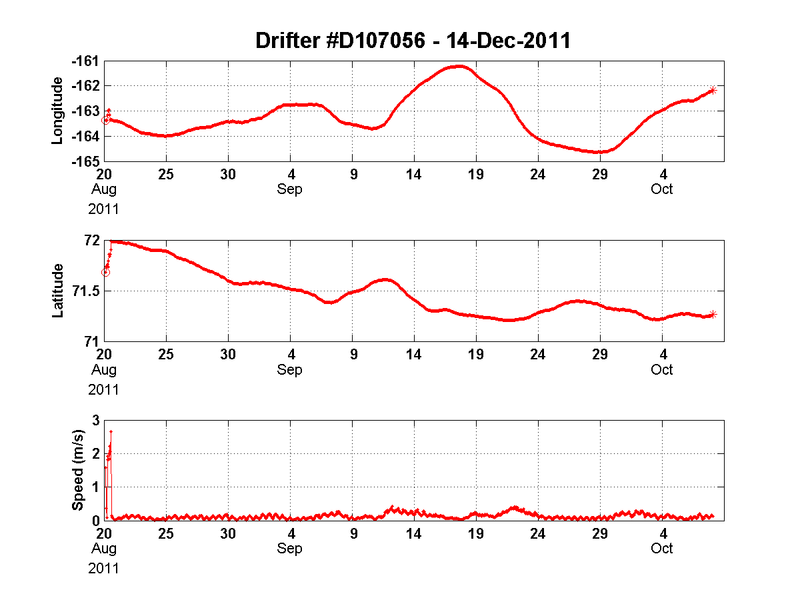 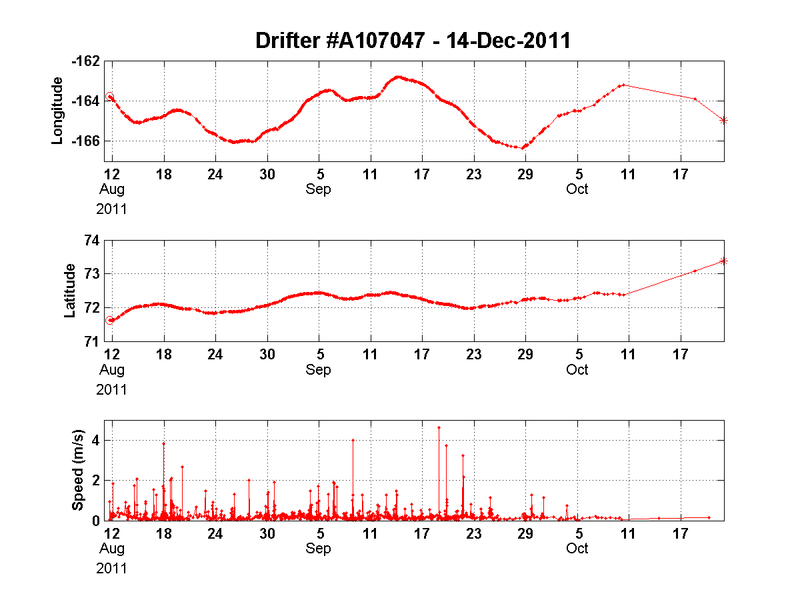 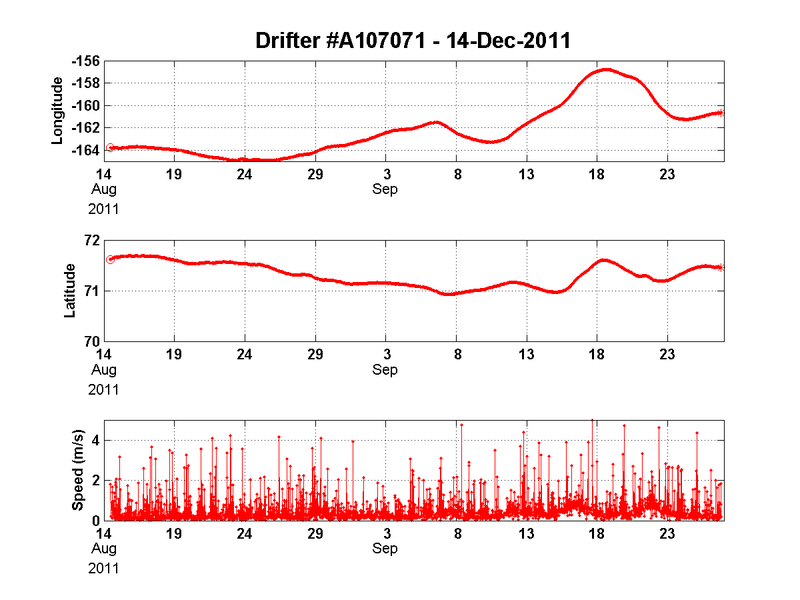 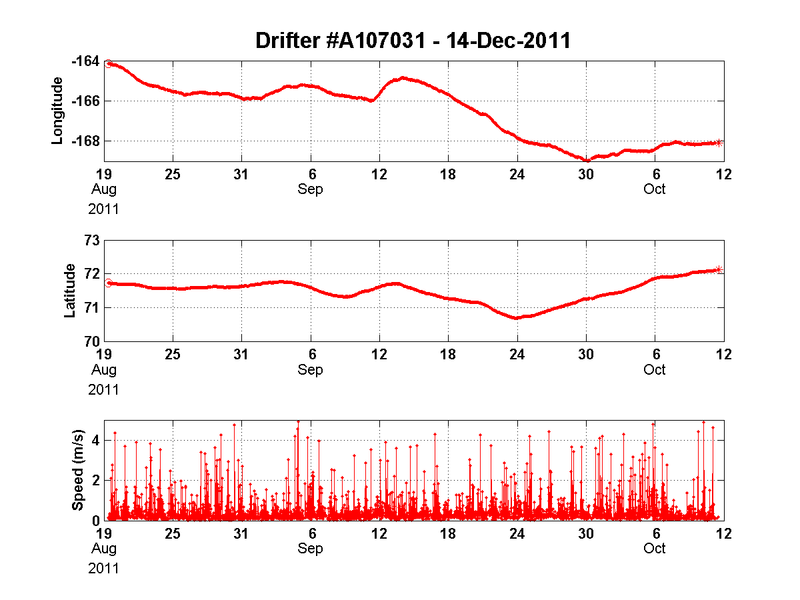 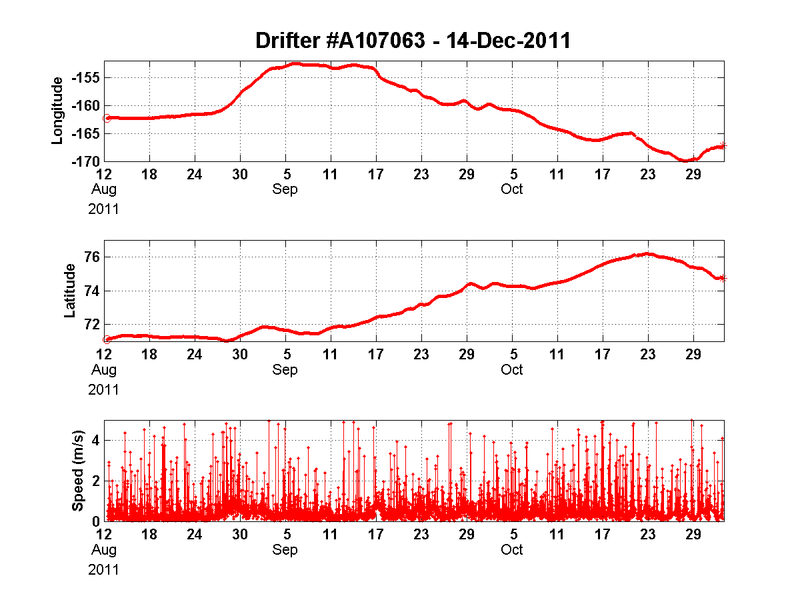 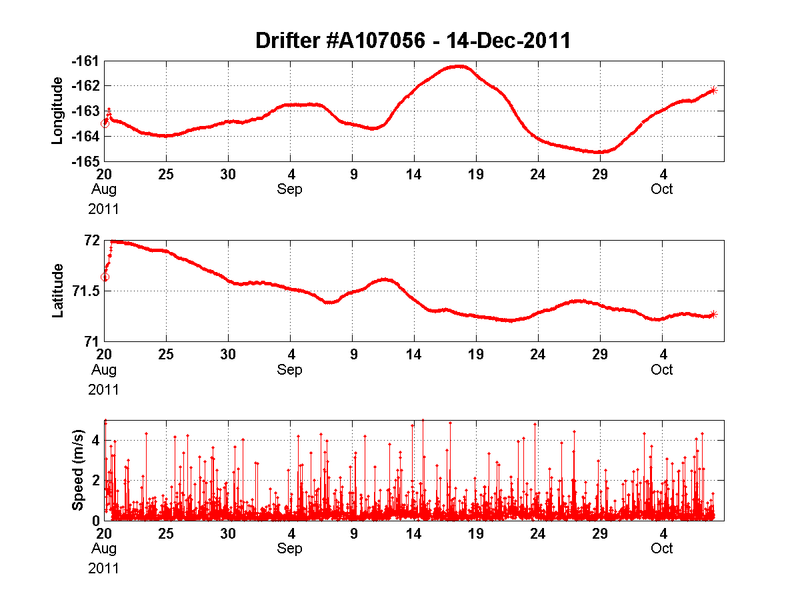 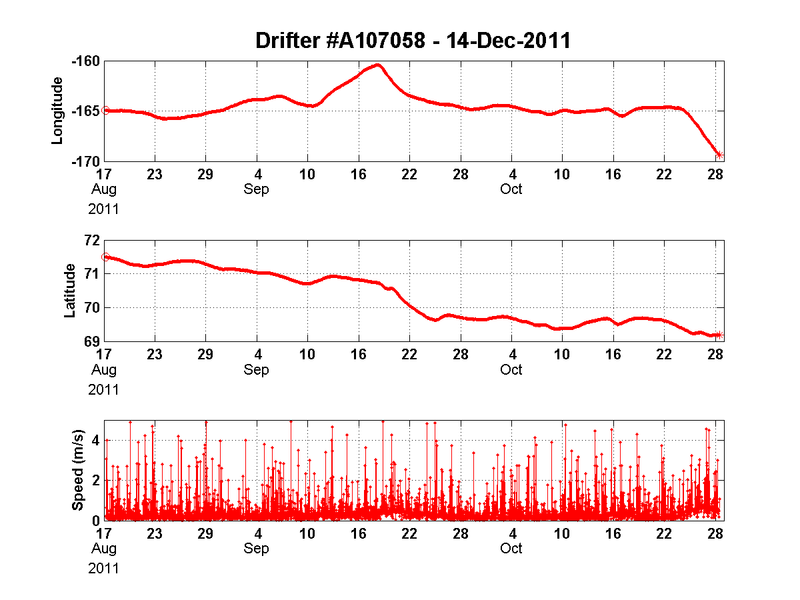 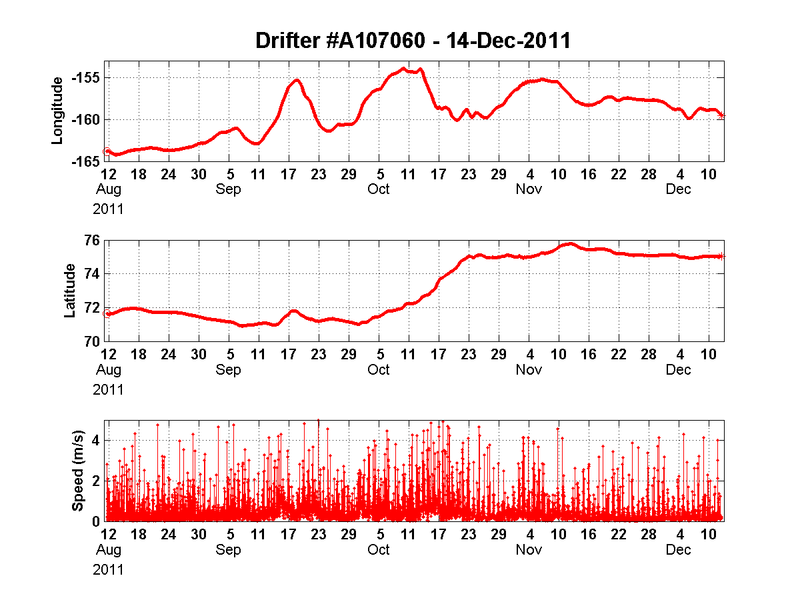 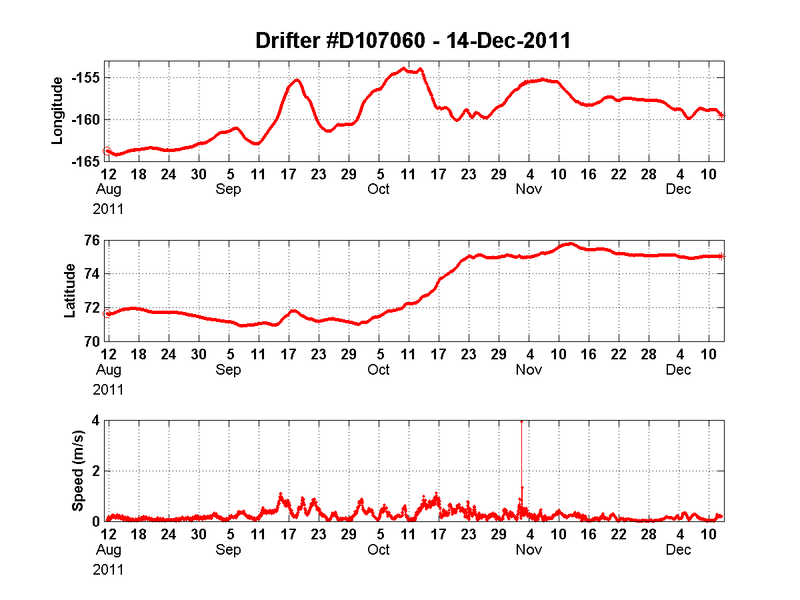 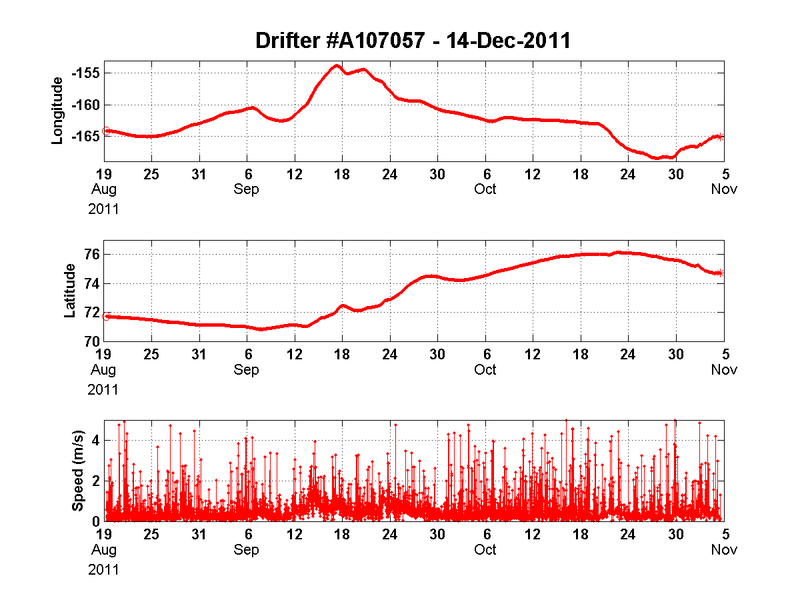 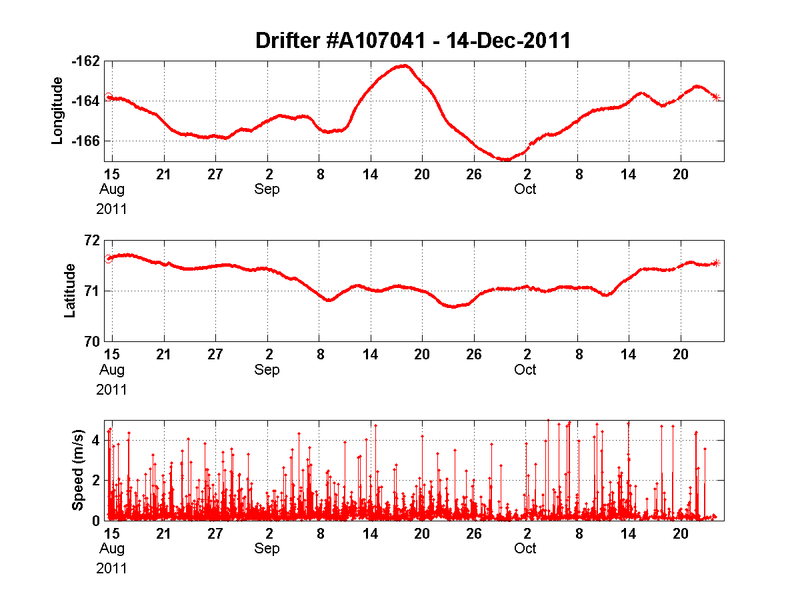 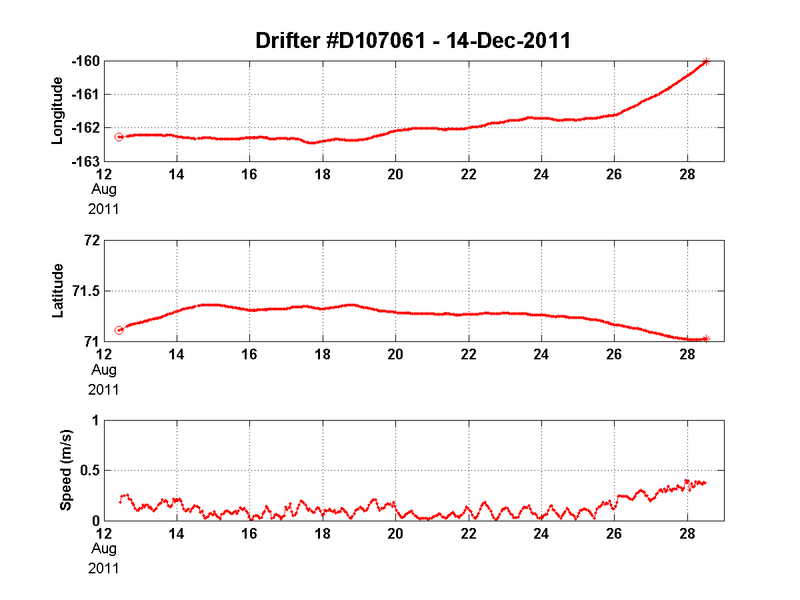 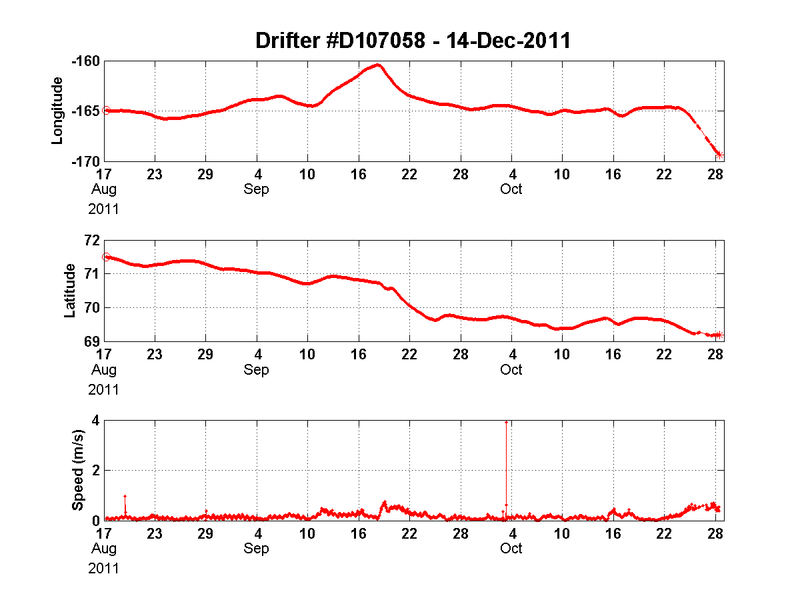 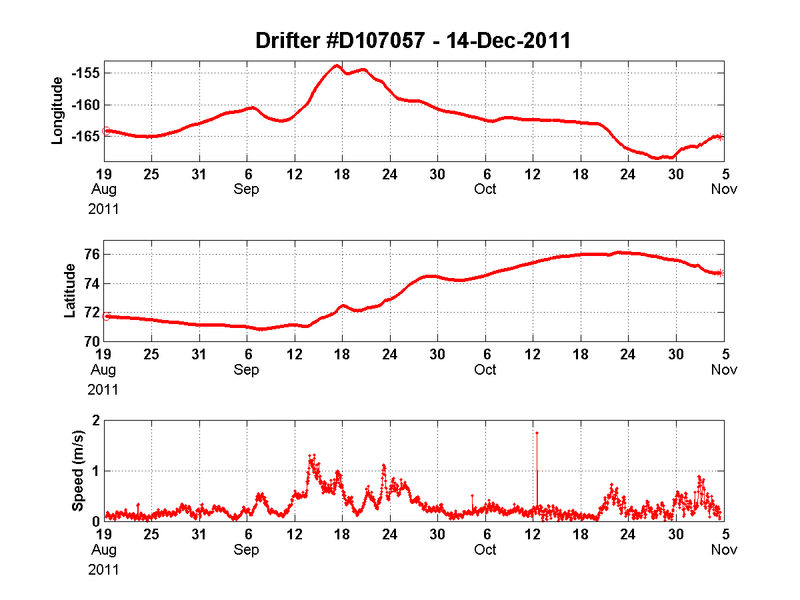 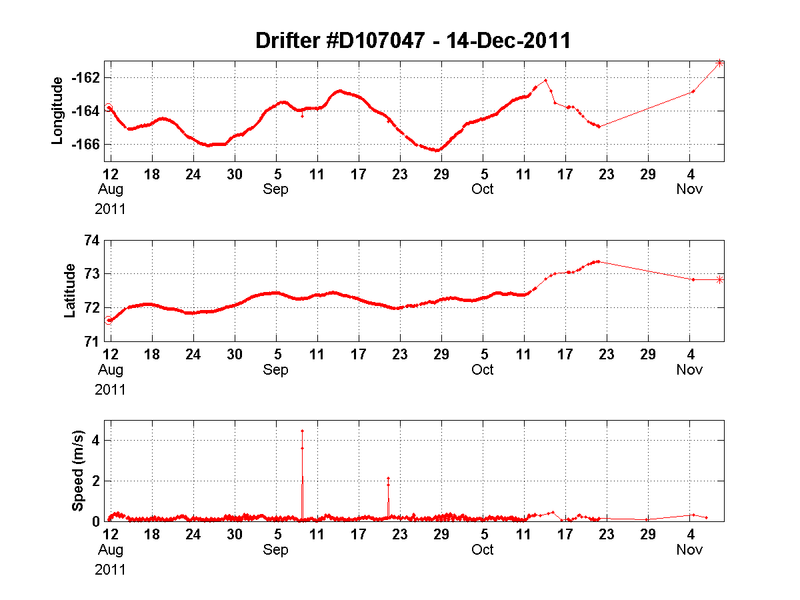 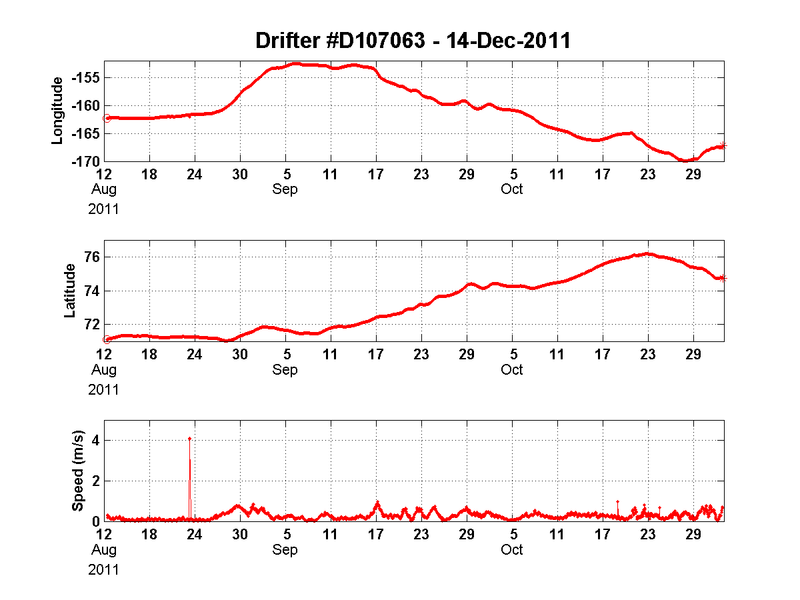 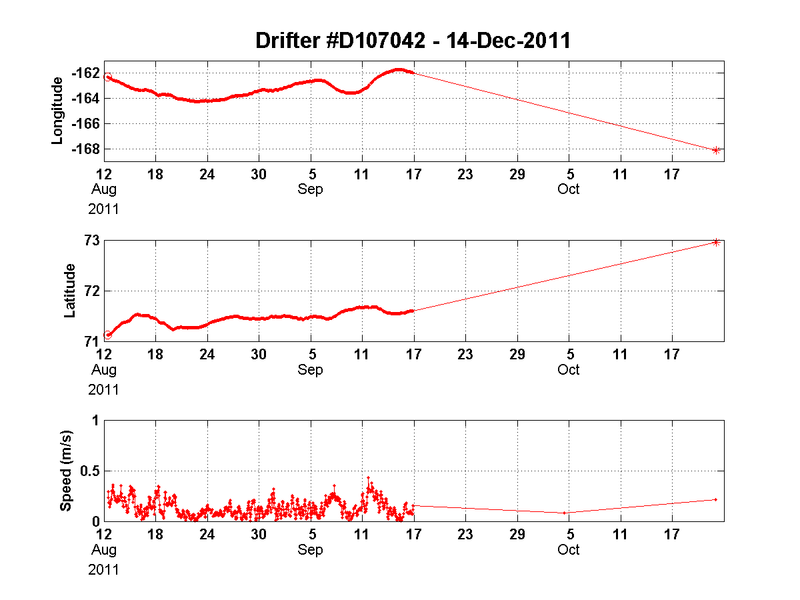 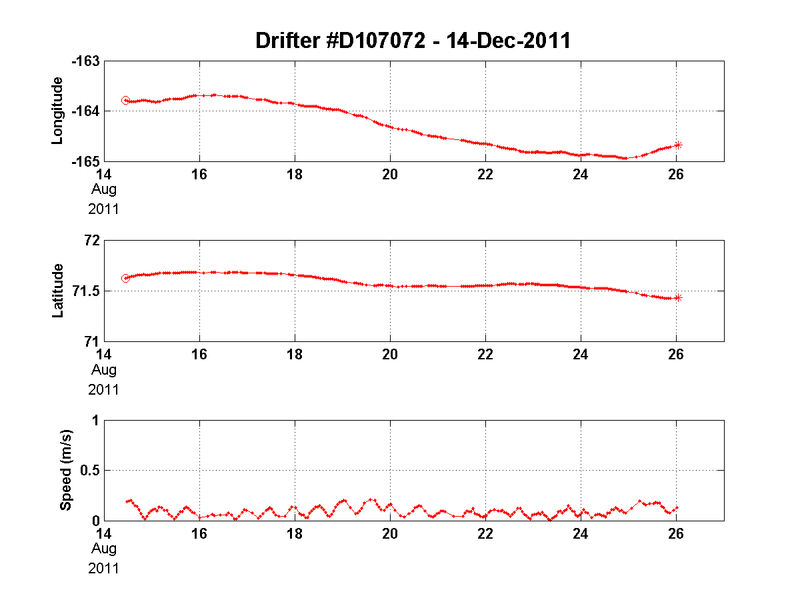 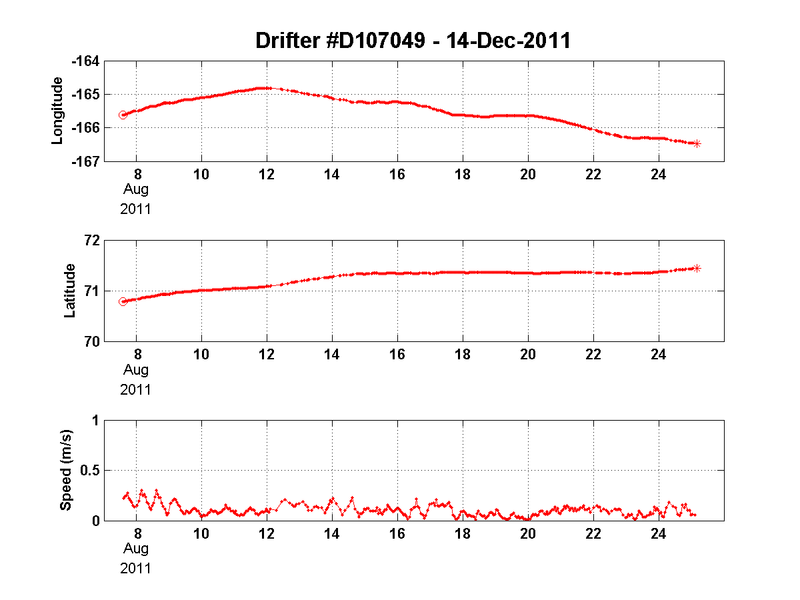 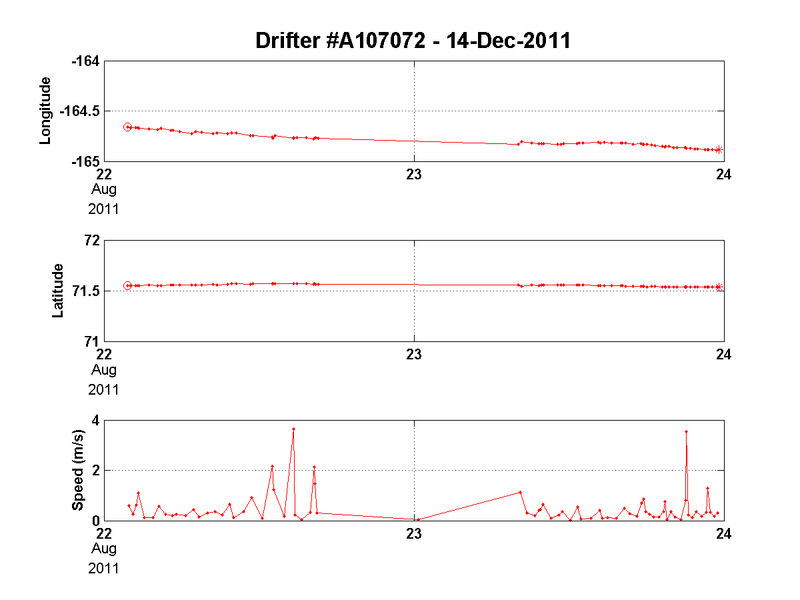 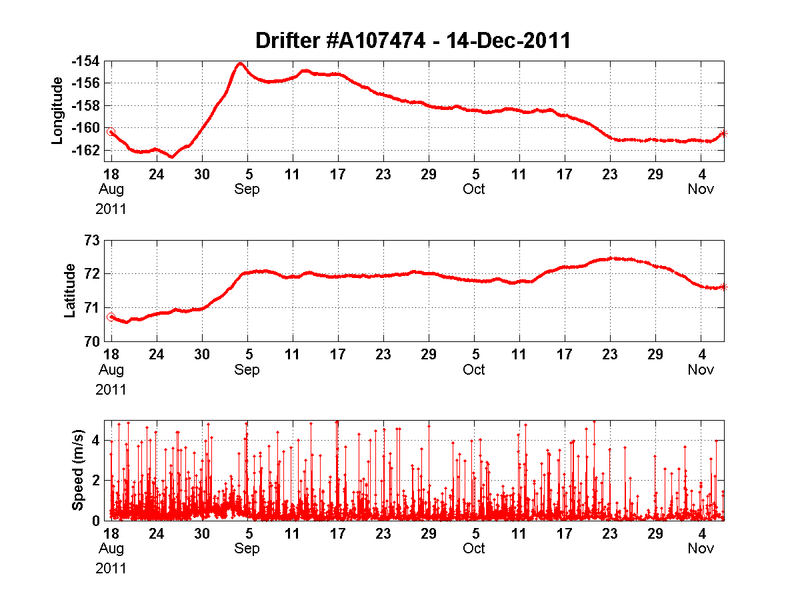 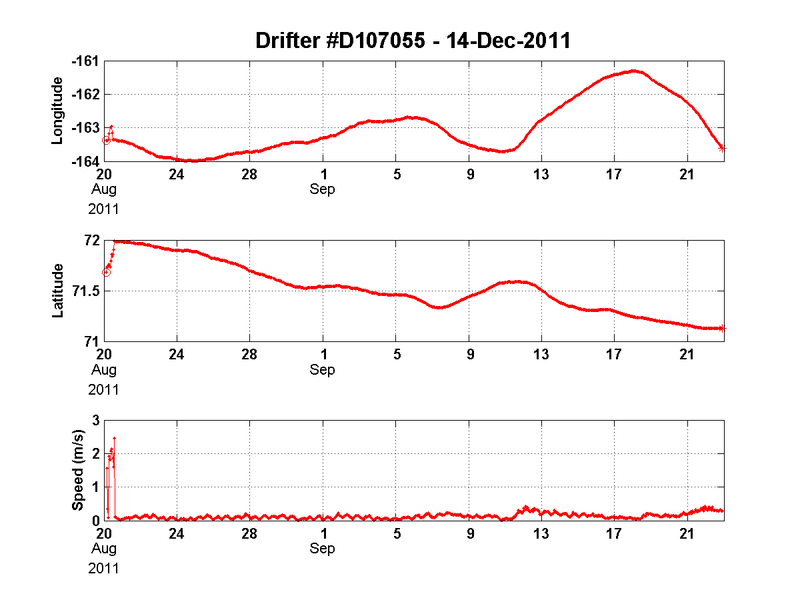 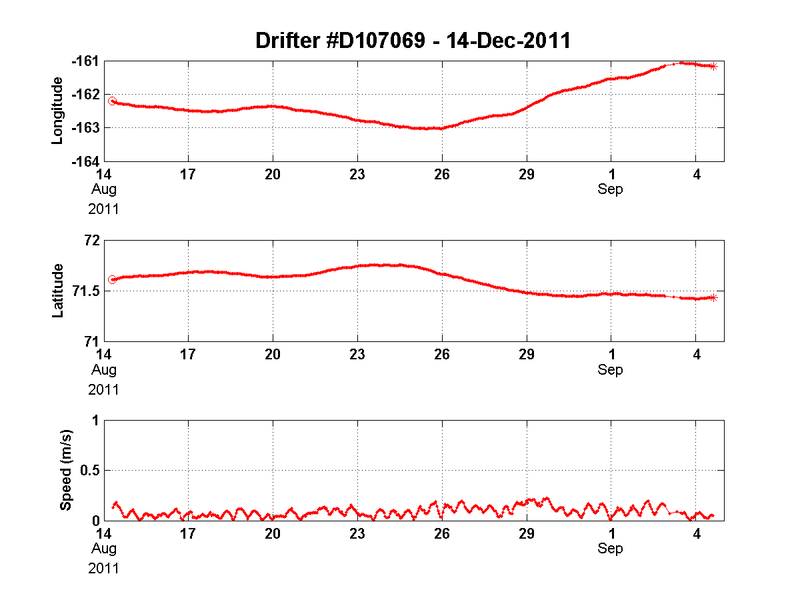 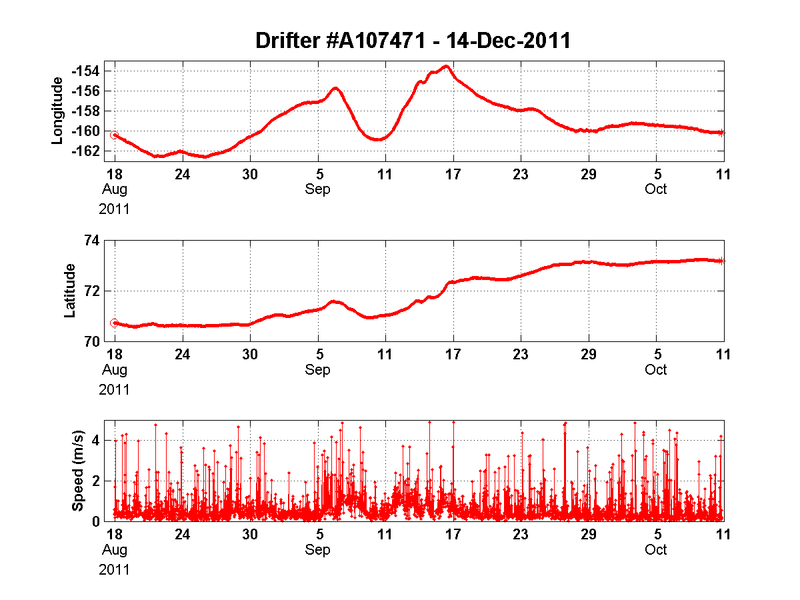 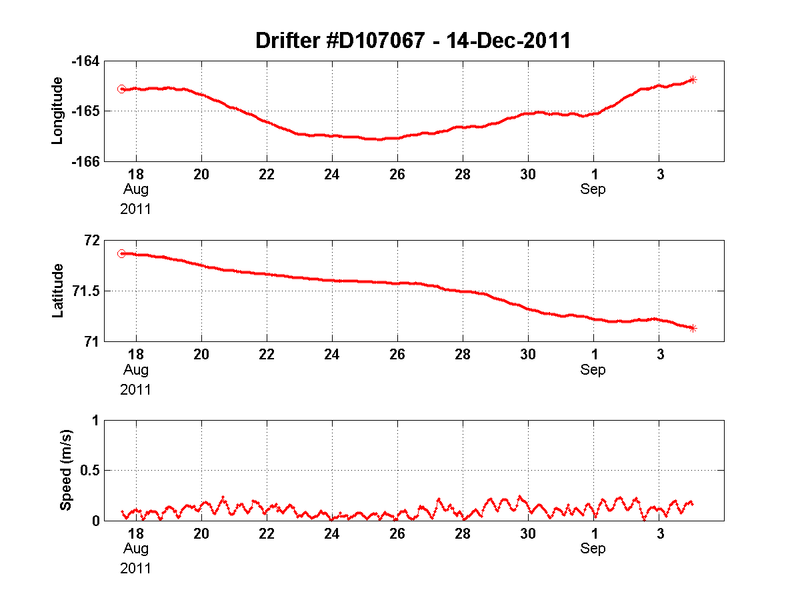 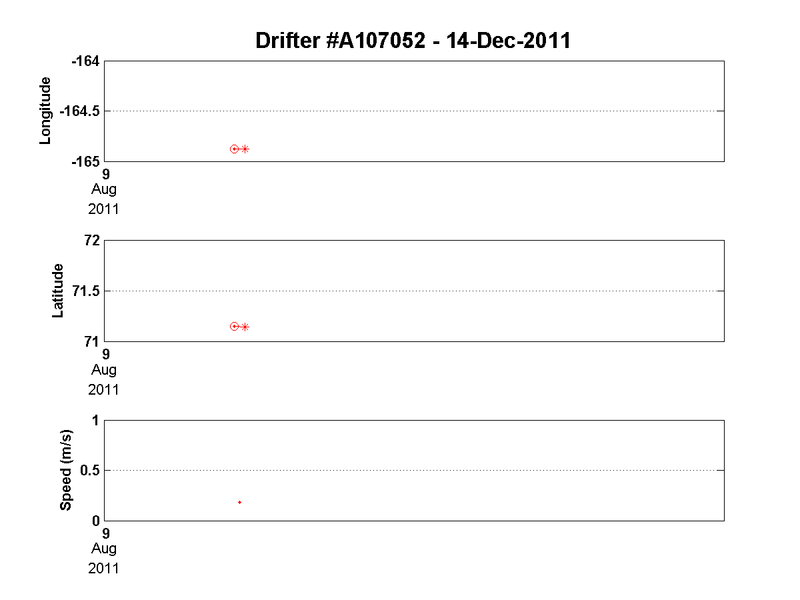 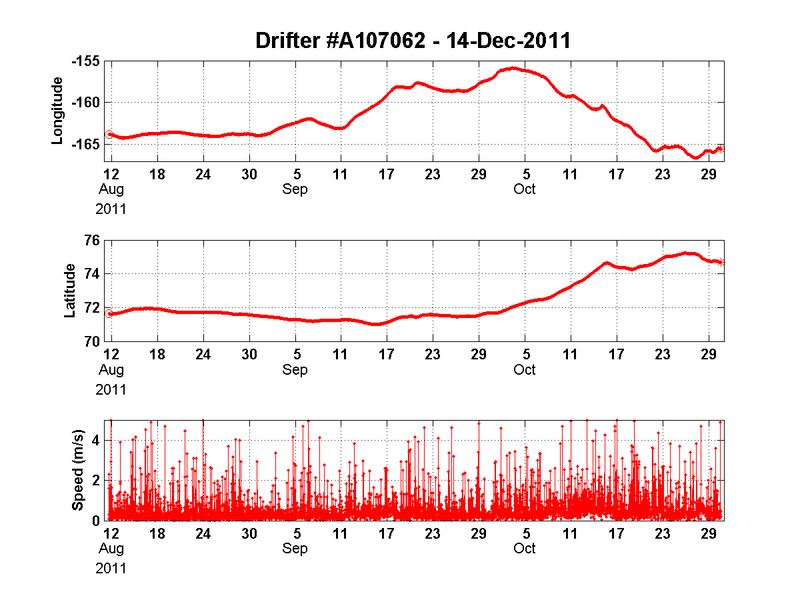 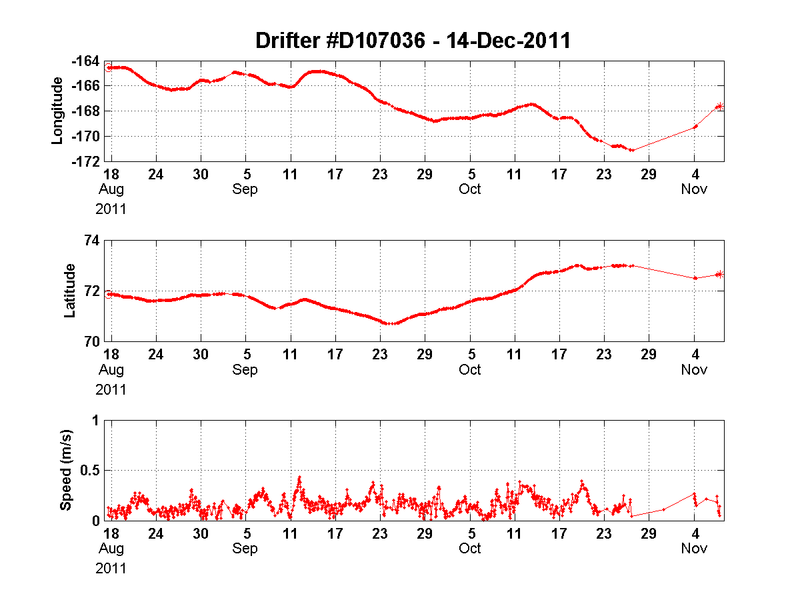 The data and this understanding will be useful in evaluating circulation and oil spill trajectory models for this shelf. 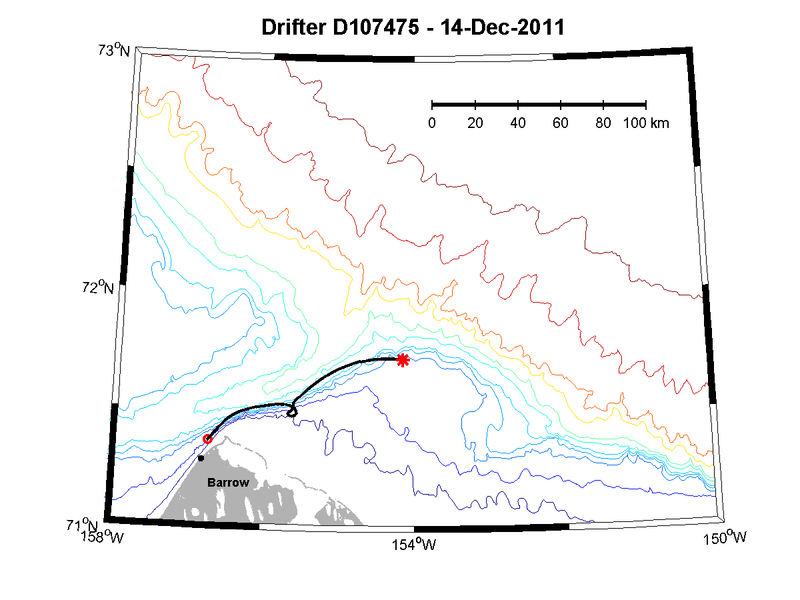 This data is used with companion studies of surface current mapping radars, instrumented moorings and autonomous gliders to engender a more comprehensive understanding of the Chukchi Sea's physical dynamics. Offshore deployments are funded through the Coastal Marine Instutute at the University of Alaska Fairbanks. Sponsors include the Bureau of Ocean Energy Management, Regulation and Enforcement (BOEMRE), Shell Oil, Conoco Phillips, and Statoil. 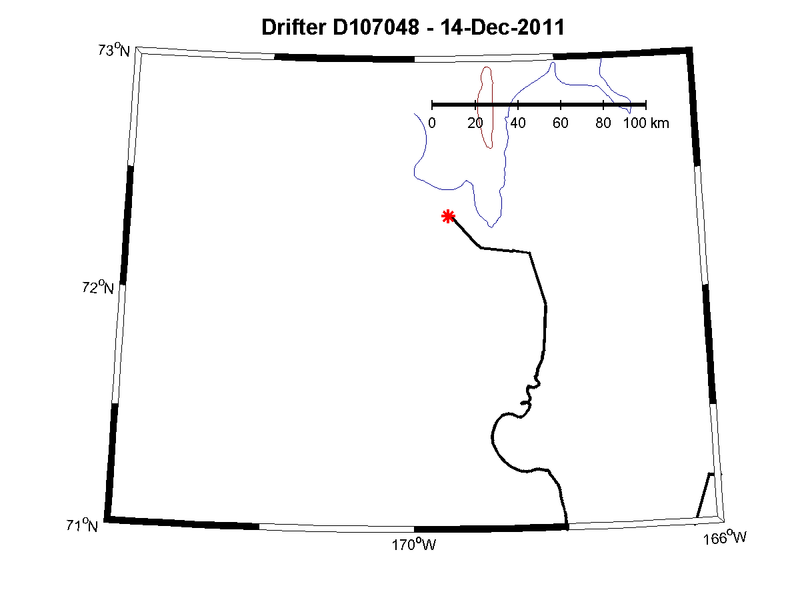 Nearshore drifter deployments are funded by the North Slope Borough/Shell Baseline Studies Program and deployed by the North Slope Borough's Department of Wildlife Management.